Welcome to the AIAA Houston Section International Activities Committee (IAC). This committee mirrors the IAC at the national level of AIAA. 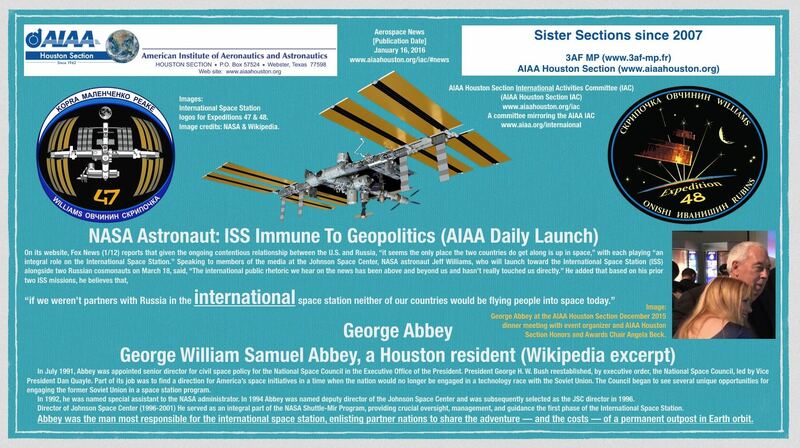 Since before 1987, this committee was our AIAA Houston Section International Space Activities Committee (ISAC). We changed the name from ISAC to IAC for a few reasons, starting with our 2014-2015 AIAA year. 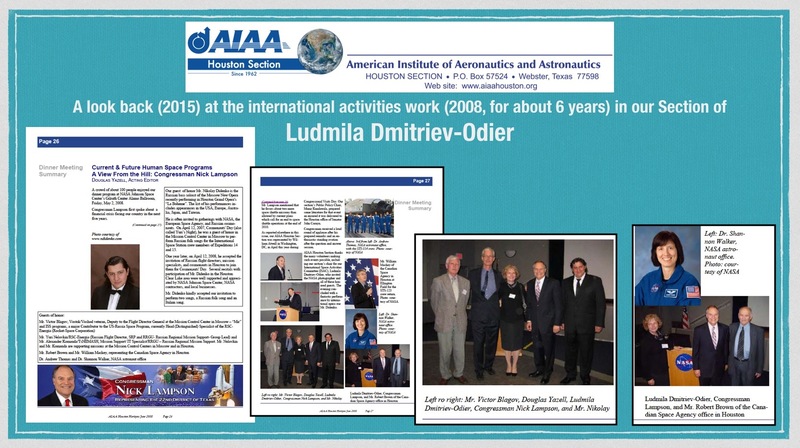 We send our thanks to Ludmila Dmitriev-Odier, our outgoing Chair of AIAA Houston Section ISAC, now called IAC. She served in this role for approximately 6 years, and a more exact record is preserved in Horizons, our Section’s newsletter. She brought many new people to participate in the work of our Section’s Council. She brought speakers to our Annual Technical Symposiums (ATS), though ISAC started in our Section’s Operations branch (see our Section’s organization chart), and those committees are not required to bring speakers to ATS. She represented our Section when she traveled to Russia to see a Soyuz launch that included cosmonaut Yuri Malenchenko. She brought a man who is a famous opera singer (Nikolay Didenko, shown below) to perform at our Section’s dinner meeting at the NASA/JSC Gilruth Center when Congressman Nick Lampson was our guest of honor. ‘O Sole Mio! She did much more than that for our Section, and much of that work is documented in Horizons. She now lives in Oklahoma. Above: (Click to zoom to see the entire image.) A look back (November 28, 2015) at Ludmila Dmitriev-Odier and her work in this role in 2008. James C. McLane, Jr. started this international work in our Section in 1987, and by this time (2008), our Section needed someone to be the Chair for this work. The featured opera singer was Nikolay Didenko, singing a Russian song, and, in honor of Congressman Nick Lampson, an Italian song! Acting IAC Chair in AIAA Houston Section (starting in early 2017): Douglas Yazell was the 2014-2015 Chair, and as this is being written on March 19, 2017, he is now Acting Chair. 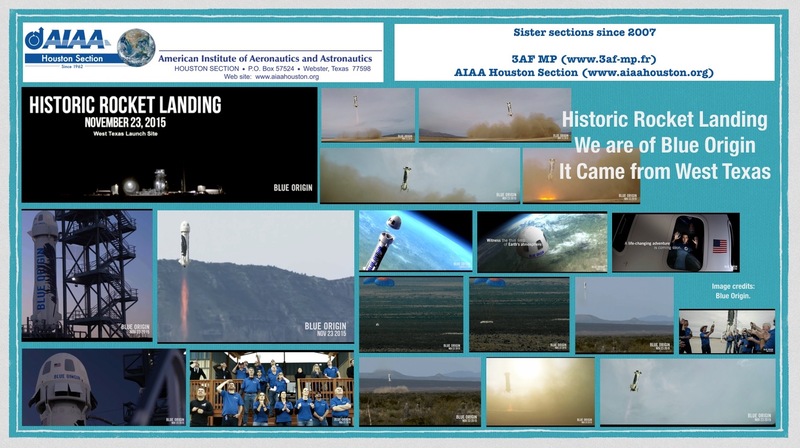 We encourage people to apply to our Section Chair (chair2016 [at] aiahouston.org, chair2017 [at] aiaahouston.org, etc.) to volunteer in this role. 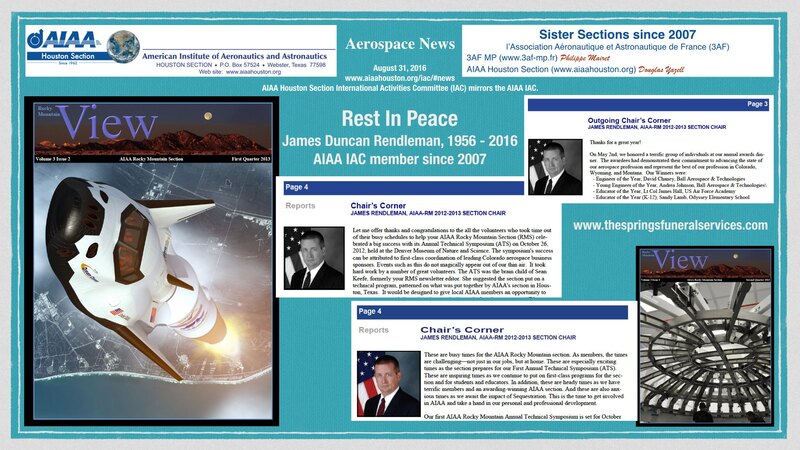 We express appreciation the late AIAA Associate Fellow James C. McLane, Jr. (1923-2012) He might have started our Section’s ISAC (now IAC) in 1987 after a visit to China based on President Dwight Eisenhower’s Citizen-to-Citizen diplomacy program. 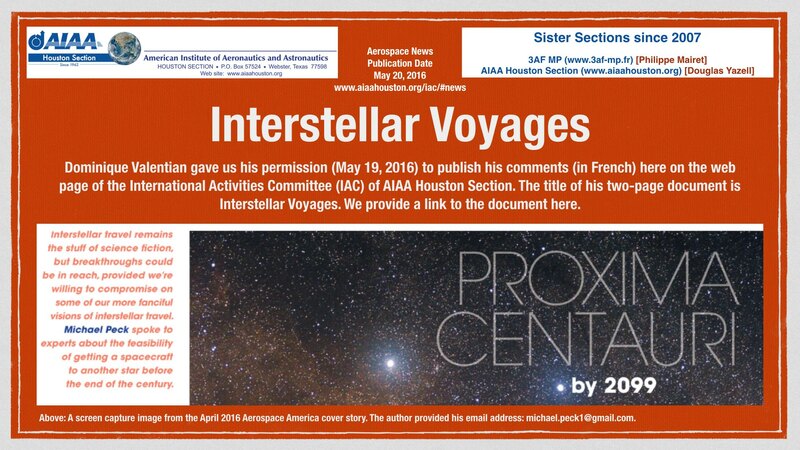 His son, AIAA Associate Fellow James C. McLane III (1945-2015), participated in our Section activities in many ways, including writing articles for our newsletter, Horizons, as summarized in a 2015 special issue of Horizons. James C. McLane, Jr. co-founded our Section’s Chinese sister section relationship in 1987 with the Chinese Society of Astronautics (CSA) in Shanghai (The Shanghai Astronautical Society, SAS). See below for more details about that, and of course, see our archived issues of Horizons at www.aiaahouston.org/newsletter and an AIAA SharePoint website (link not specified here for now). Philippe Mairet, 3AF MP (www.3af-mp.fr), the former longtime contact person in France for our French-American sister section work. Our French sister section is l’Association Aéronautique et Astronautique de France (3AF), Midi-Pyrénées Chapter (3AF MP). Douglas Yazell, AIAA Houston Section contact person for our French sister section work, 3AF MP (www.3af-mp.fr). Marlo Graves, contact person for our Chinese sister section. Since 1987, that has been a relationship with the Chinese Astronautical Society (CSA) in Shanghai. A few years ago, maybe in 2008 (see Horizons), Marlo Graves traveled to China on behalf of AIAA Houston Section. She was visiting Beijing and made contacts there on behalf of our Section. She also made a detour to Shanghai to visit our CSA colleagues. 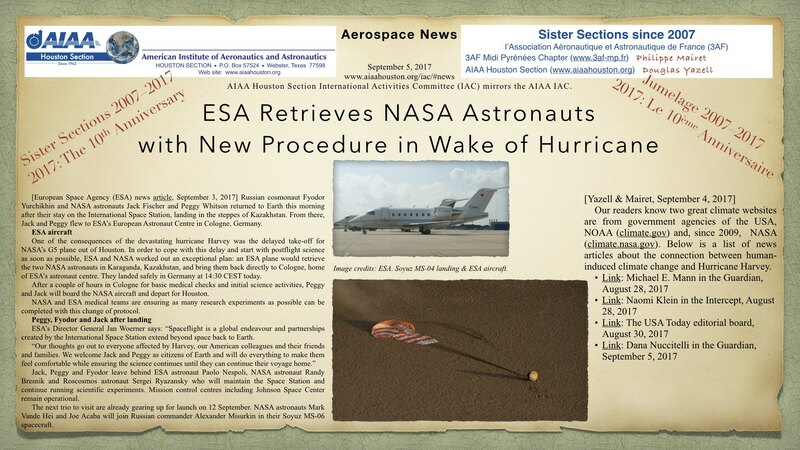 As of August 2014, we note that AIAA (at the national level) is pleased to be doing new work with the CSA. Marlo Graves and AIAA Houston Section are eager to support AIAA in that work. [November 29, 2015: Marlo Graves moved away from Texas, so this position as the contact person for our Section’s Chinese sister section is now open again. Please look around this web page for more details about that work. It is easy to contact our sister section in Shanghai, thanks to our modern internet age. 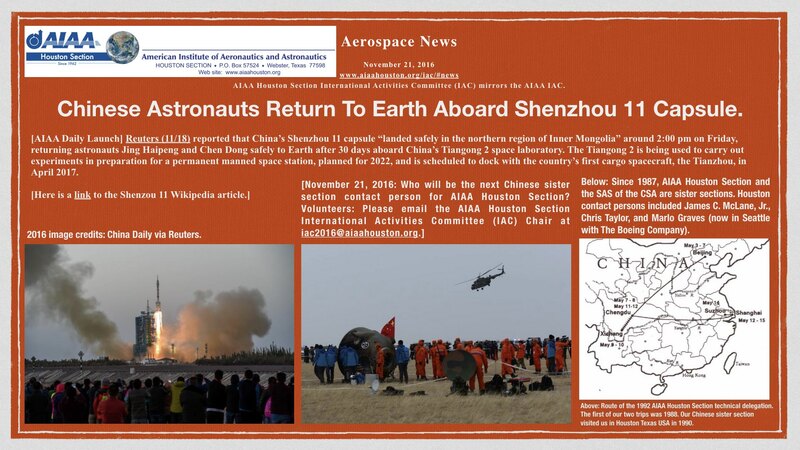 In our NASA/JSC community, we no doubt enjoy the company of a few colleagues with a strong connection to China (Shanghai, Beijing, etc.). Contact information: see the organization chart on this website.] As shown in Horizons and on our website, Chris Taylor was our contact person for this work prior to Marlo Graves and after the sister section founder or co-founder James C. McLane, Jr. While serving in this AIAA Houston Section role, Mr. Taylor was once in Shanghai on a business trip and he enjoyed dinner in a restaurant with some of our former Chinese sister section members. 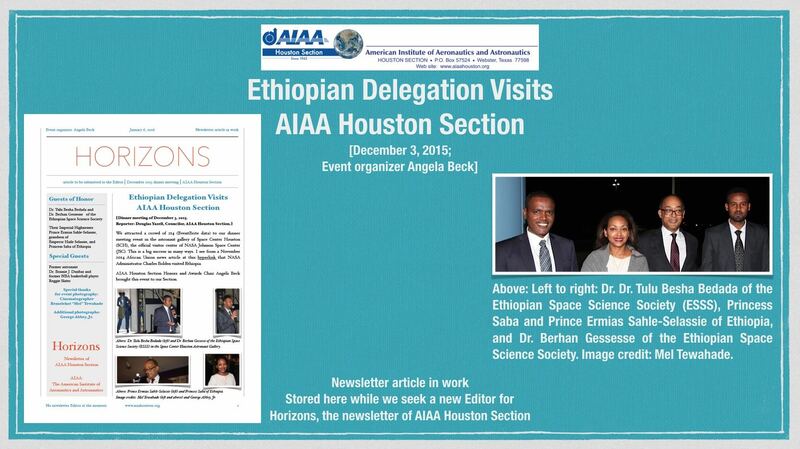 Our Ethiopia-USA sister section contact people in Houston are Angela Beck, Thomas Haregot, and Dr. Yared Kidane. 2017 AIAA Houston Section IAC Acting Chair Douglas Yazell is listing their names here as of March 19, 2017. Jackelynne (Jacky) Silva-Martinez proposed a Peru-USA sister section relationship with the Arequipa chapter of an astrobiology scientific society in Peru, SCAP. As of March 19, 2017, AIAA Houston Section is in the process of voting on that. [We voted yes, and this Peru-USA sister section relationship started on March 27, 2017, as shown in a news article below.] Jacky is AIAA Houston Section Young Professionals Chair. She proposed, organized and followed through on a December 2016 dinner meeting for our Section. 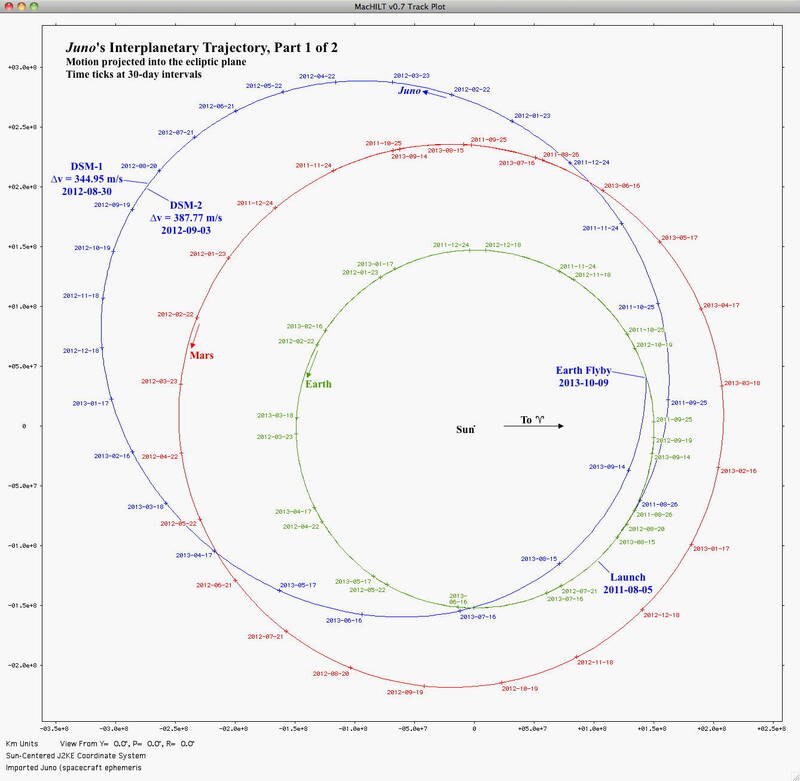 2014_08_31_Yazell_and_Mairet_for_Horizons (3 pages, 964 KM, PDF file), August 31, 2014. This contains articles about the 3 subjects shown below. 2014_10_31_Yazell_and_Mairet_for_Horizons Reduced Size PDF.pdf (8 pages, 378 KB). This installment contains two articles. The first subject is the ESA Service Module for the NASA Orion MPCV. The second subject is the inevitable rise in sea level now that global warming destabilized the ice sheets in western Antarctica. NASA/JPL published those results in May of 2014 using data from ESA’s CryoSat. Additional writing by Philippe Mairet and Douglas Yazell is presented below in the News section of this web page. [March 19, 2017] We now have two active sister sections, our since-2007 French sister section and our since-2017 Ethiopian sister section. Since March 7, 2017, AIAA Houston Section is voting on a Peruvian sister section. More information about all 3 of those is provided elsewhere on this web page. After James C. McLane, Jr. founded or co-founded our Chinese sister section in 1987, others followed (India, with Dr. Zafar Taqvi, Austria or Germany, with Chris Burmeister, Australia, with Russ Filler, and maybe others). [Mach 19, 2017] Our Ethiopia-USA sister section is the Addis Ababa branch of The Ethiopian Space Science Society (ESSS, www.ethiosss.org.et). The one-page proclamation is officially dated February 7, 2017. 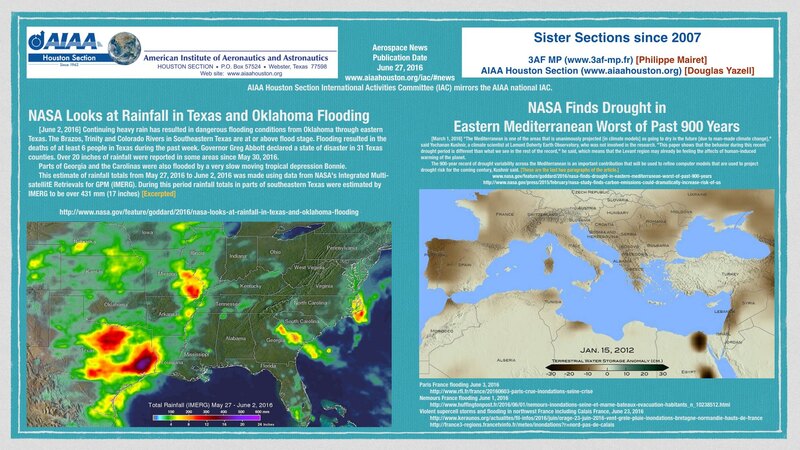 Today we are publishing a draft of a news article on this web page at www.aiaahouston.org/iac/#news, also available, we hope, at www.aiaahouston.org/#ESSS, so that readers need not scroll down later. Houston contact people: Angela Beck, Thomas Haregot, and Dr. Yared Kidane. Addis Ababa contact people, Dr. Tulu Besha Bedada and Dr. Berhan Gessesse. The 2007 proclamation creating our sister section relationship. This is a permanent sister section relationship. It is still going well as of October 2018. The 3AF MP organization chart is in Horizons. It is found in the May / June 2014 issue and earlier issues. As of October 2018, the current 3AF MP President is Francis Guimera. About 10 years ago, the 3AF MP President was Alain Chevalier. Mr. Chevalier is now the 3AF MP newsletter Editor. Their newsletter is la Gazette. 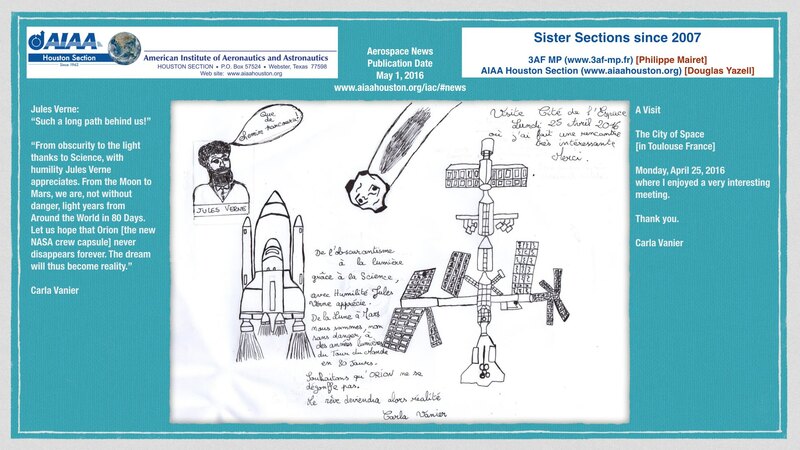 In France, Philippe Mairet of 3AF MP was the a longtime contact person for AIAA Houston Section’s sister section work with 3AF MP. As of October 2018, no specific sister section contact person is assigned within 3AF MP. They are searching for the next person to fill that role, but the sister section relationship continues in any case. A Shanghai to Houston delegation visited us in the NASA/JSC community in 1990. Jules Verne and ISS, a 2004 lunch-and-learn event at NASA/JSC in Building 16. Our speaker for this event was Brian Rishikof of Odyssey Space Research. That company was being created at about the time of this event. Jules Verne was the first of five Automated Transfer Vehicles (ATVs) provided by the European Space Agency to carry cargo to the International Space Station (ISS). 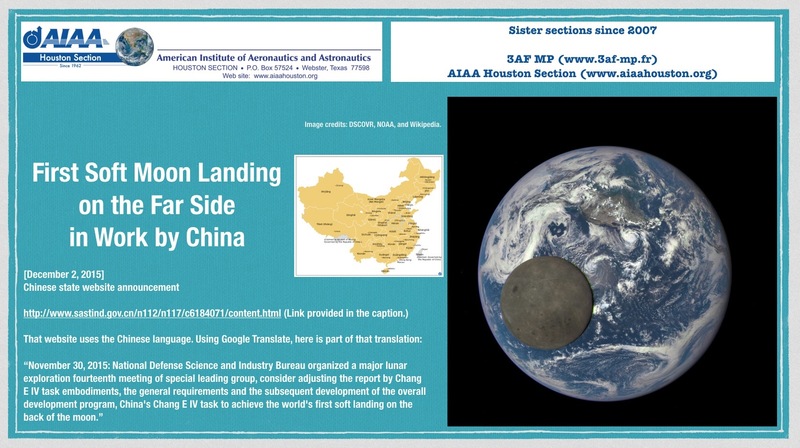 The Rise of China’s Space Program, a 2008 lunch-and-learn event at NASA/JSC in the Gilruth Center. Our speakers for this event were Marlo Graves and Stephen Abrams. An unusual photo from January 28, 2015, by Douglas Yazell, above Armand Bayou at Bay Area Park: A Slovakian Aero L-39 Albatros jet trainer!? 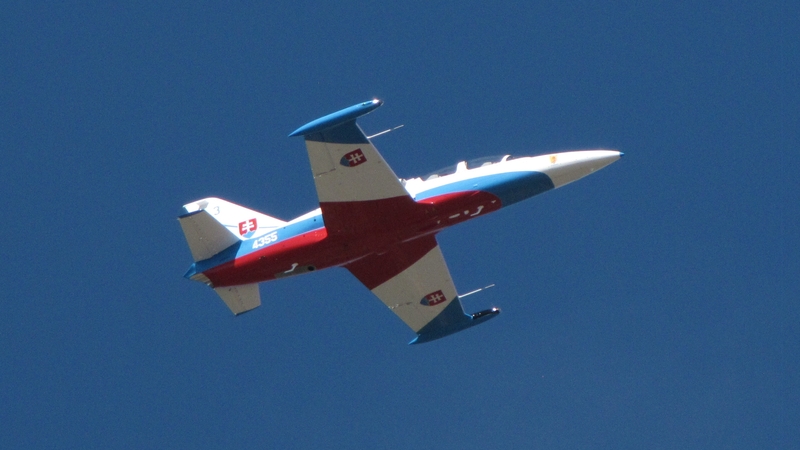 Above: Jet trainer from Slovakia seen from the Bay Area Park boardwalk over Armand Bayou in the area of Houston Texas USA. Image credit: Douglas Yazell. The CBS News (2/16, Casey) website noted that the cargo spacecraft “burned up safely” over the Pacific. ISS astronaut Terry Virts was able to capture the spacecraft leaving the ISS in a time-lapse video. [2015 03 01] March 1, 2015. An amazing photograph by Jay Ouellet (below). It is copyrighted and used here with permission. It shows a night scene of Quebec City Canada. It includes not only the Moon, but also Venus and Mars. For February 28, 2015, this was the NASA Astronomy Photo of the Day (APOD). While anyone can view it on that website, we add it here since this photograph is so inspiring. Explanation: Taken on February 20, five different exposures made in rapid succession were used to created this tantalizing telephoto image. 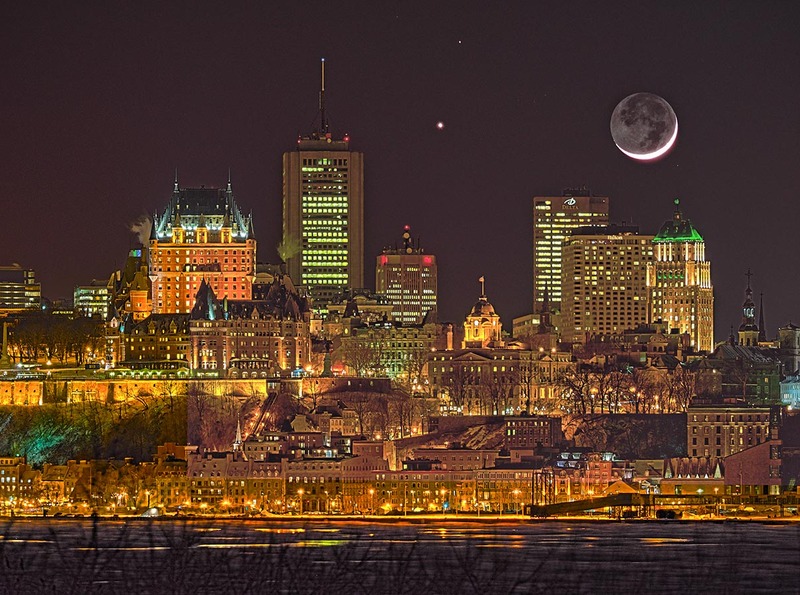 In combination, they reveal a wide range of brightness visible to the eye on that frigid evening, from the urban glow of the Quebec City skyline to the triple conjunction of Moon, Venus and Mars. Shortly after sunset the young Moon shows off its bright crescent next to brilliant Venus. Fainter Mars is near the top of the frame. Though details in the Moon’s sunlit crescent are washed out, features on the dark, shadowed part of the lunar disk are remarkably clear. Still lacking city lights the lunar night is illuminated solely by earthshine, light reflected from the sunlit side of planet Earth. [2015 11 30] December 7, 2015: A proposed newsletter article: An Inconvenient Present and Future, by Douglas Yazell, Horizons contributor. Subtitle: A 2004 Book, a 2006 Movie, & a 2008 GeoJournal Issue. 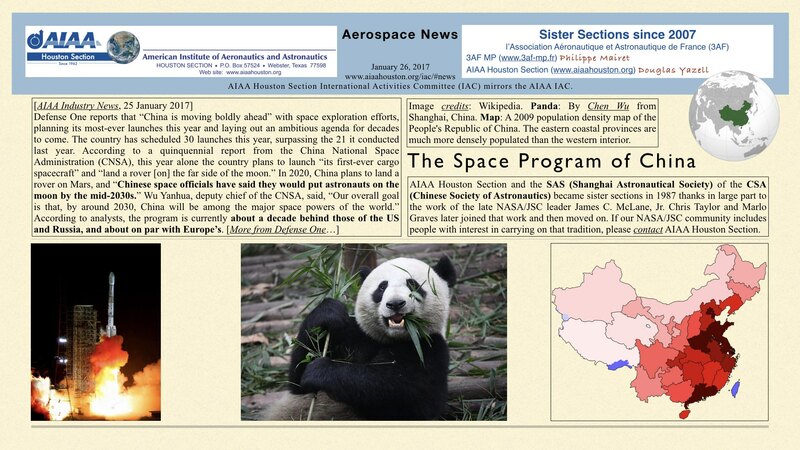 A proposed newsletter article for Horizons, newsletter of AIAA Houston Section. We do not have an Editor at the moment so I will store this article here for now. (24 pages, NewGeoJournalAIAAYazellHorizonsFromTemplate, PDF, 8 MB). I can format the article using a word processor. That is good enough. I will submit the article to an editor. But I experimented with formatting. I wanted free newsletter software that would automate creation of a Table of Contents. With help from an Apple Store, we used iBooks Author on my 2010 MacBook Pro using OS X El Capitan. But I cannot link to that iBook on this web page. That violates a security rule on this WordPress web page. I could email it or use Dropbox. But we were surprised to learn that only iBooks can read that output format (ePub). So the proposed article is in the iBooks Store, but only Apple internet devices can read it. It is a free book. Just search the iBooks Store for the author or title above. I discuss the 2004 Michael Crichton book State of Fear, the 2006 movie An Inconvenient Truth, and the 2008 issue of GeoJournal which reviewed the scientific accuracy of that 2006 movie. 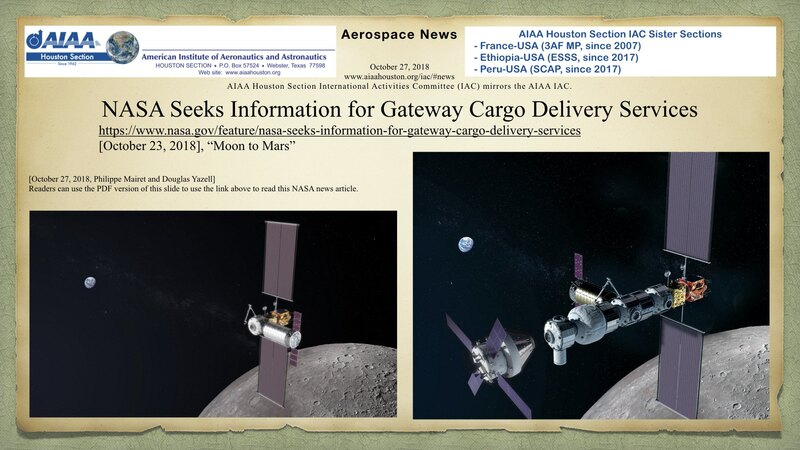 [2018 10 27] NASA Seeks Information for Gateway Cargo Delivery Services, [October 23, 2018, NASA news article “Moon to Mars”]. 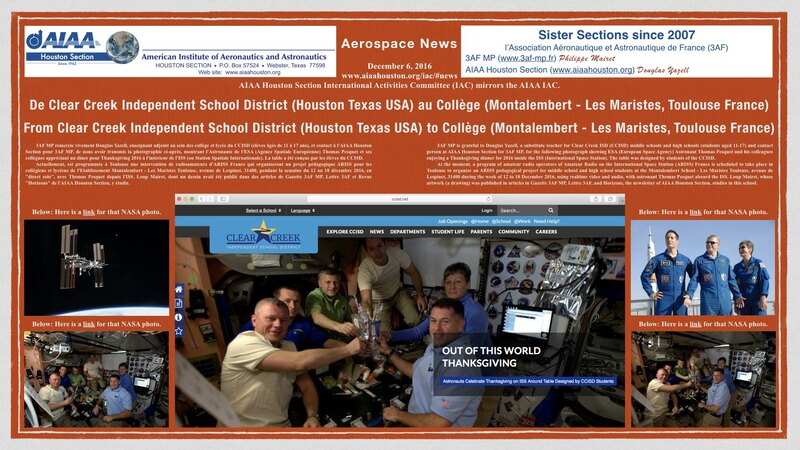 AIAA Houston Section news article prepared by Philippe Mairet and Douglas Yazell. Here is a link to the PDF version of the JPEG image below. Image credits: NASA. [2018 03 09] “What if Aliens Were Hiding from Us All This Time?” Maïlys Gleizes, Already a Great Artist at Age 16. Her father, Gilles Gleizes, is a member of 3AF MP. We send our thanks to Maïlys Gleizes for permission to use her art here. Here is a link to the PDF version of the JPEG image below. 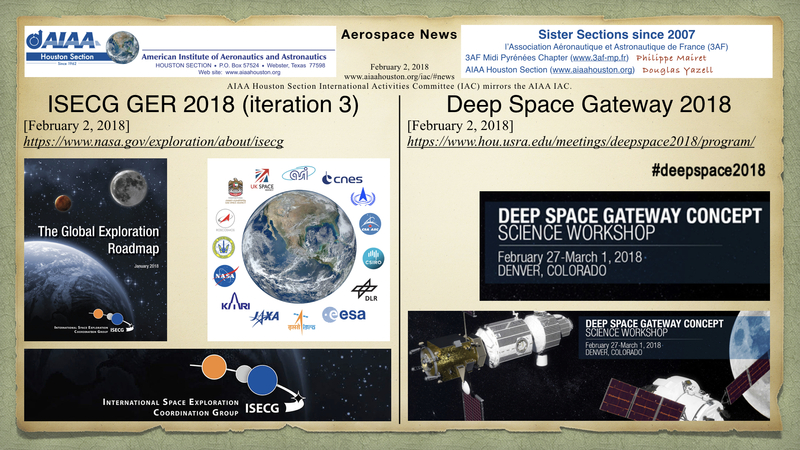 [2018 02 02] Published here February 2, 2018. International Space Exploration Coordination Group (ISECG) Global Exploration Roadmap (GER) 2018 and Deep Space Gateway (DSG) 2018. Here is a link to the PDF version of the JPEG image below. [2017 11 22] Published here November 22, 2017. Drawing by Valentin Delas. In other news from NASA, Solar System’s First Interstellar Visitor Dazzles Scientists. Here is a link to the PDF version of the JPEG image below. [2017 09 05] Published here September 5, 2017. ESA Retrieves NASA Astronauts with New Procedure in Wake of Hurricane, a news article from the European Space Agency (ESA), September 3, 2017, with the connection between the human-induced climate crisis and Hurricane Harvey, by Douglas Yazell & Philippe Mairet. Here is a link to the PDF version of the JPEG image below. [2017 06 29] Published here June 29, 2017. Mapping the Demographics of France in the USA. Here is a link to the PDF version of the JPEG image below. [2017 06 20] Published here June 22, 2017, Energy Perspectives 2017, by Eirik Wærness, senior Vice President and economist at Statoil, James A. Baker III Hall, Rice University Baker Institute for Public Policy, Center for Energy Studies. 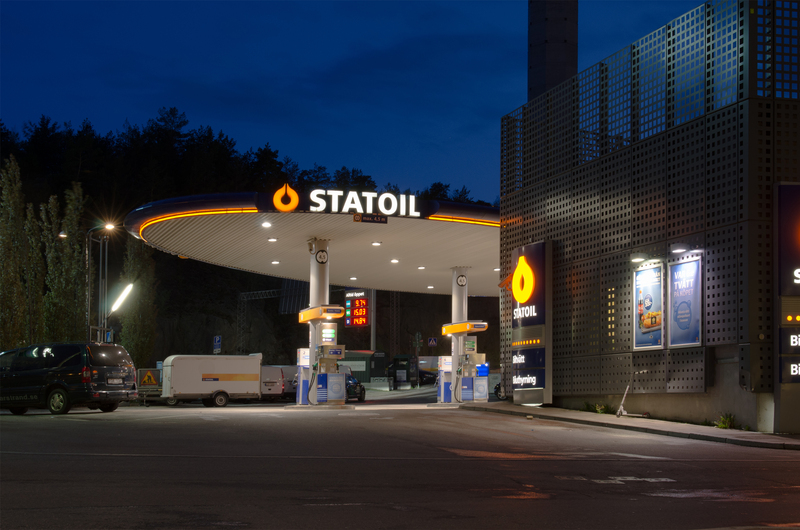 Statoil is a Norwegian-based energy company with operations in more than 30 nations. Here is a link to the event web page of Rice University, which now (June 22, 2017) presents a video (and audio) recording of the event. I (Douglas Yazell) attended (8 to 10 AM) and used my iPhone 5 to create an audio recording, but I arrived 15 minutes late. The government of Norway subsidizes $50,000 to $60,000 for a purchase of a Tesla all-electric car. Regarding the human-induced climate crisis, I paraphrase by writing that the guardrail of 2 C must be respected, but radical changes are required. From the publicity flyer and the Rice University event website: Eirik Wærness, senior vice president and chief economist at Statoil, has broad experience in government, academia and private sector companies, and in different advisory and leadership positions. Since 2016, he has served as a nonexecutive member of the board of the Financial Supervisory Authority of Norway (Finanstilsynet), as a member of the World Economic Forum’s Global Future Council on the Future of Energy, and as a chief expert advisor for the World Economic Forum’s Global Energy Architecture Performance Index. He also previously served as a member of the executive board of Norges Bank, the central bank of Norway. His prior experience includes positions with the Norwegian Ministry of Finance, Total E&P Norges, Pöyry Management Consulting and the ECON Centre for Economic Analysis. At Statoil, he has held roles in corporate strategy, corporate planning and analysis, the economic analysis of upstream Norway, energy market analysis, and mid- and downstream strategy, in addition to his current role. He has also served as a member of two public commissions on tax reform. Wærness received a B.A. in economics and comparative politics and an M.A. in economics from the University of Bergen in Norway. From the publicity flyer: Kenneth B. Medlock III, Ph.D., provided the welcome and introduction. He is the James A. Baker III and Susan G. Baker Fellow in Energy and Resource Economics and Senior Director, Baker Institute for Energy Studies. [2017 06 16] Published here June 16, 2017. 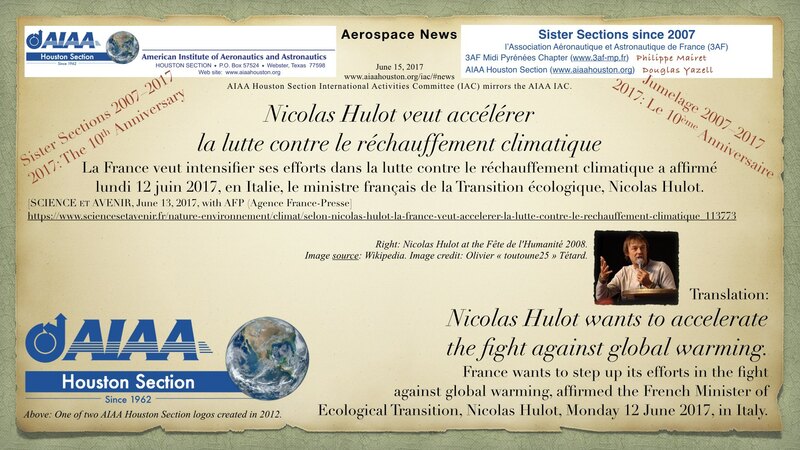 Nicolas Hulot wants to accelerate the fight against global warming. France wants to step up its efforts in the fight against global warming, affirmed the French Minister of Ecological Transition, Nicolas Hulot, Monday 12 June 2017, in Italy. Here is a link to the PDF version (2.4 MB) of the JPEG image below. [2017 06 13] Published here June 13, 2017. The Climate Needs Space. 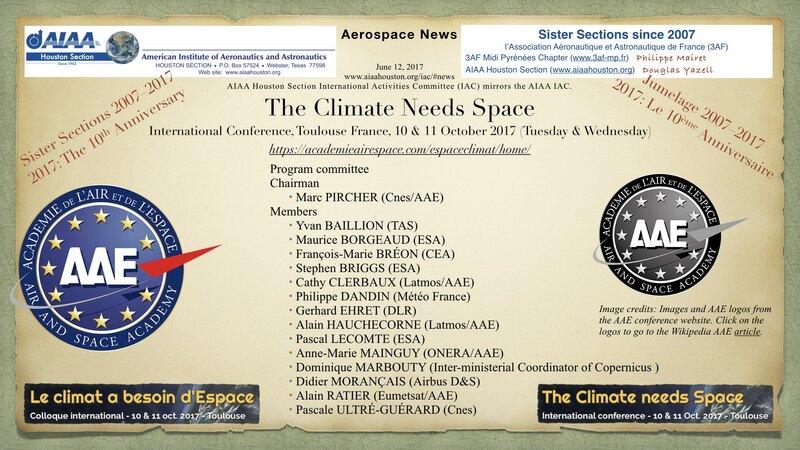 An upcoming climate conference from AAE in Toulouse France. Here is a link to the PDF version (3.5 MB) of the JPEG image below. [2017 05 29] Published here May 29, 2017. 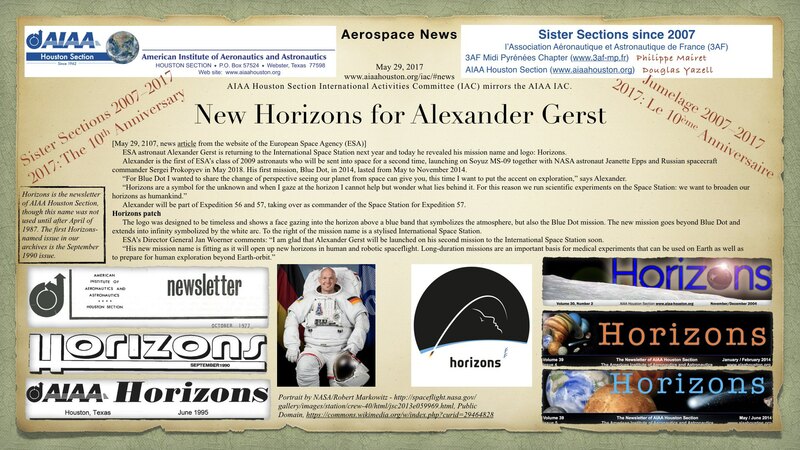 New Horizons for Alexander Gerst. Here is a link to the PDF version (4 MB) of the JPEG image below. [2017 04 19] Published here April 19, 2017. First Peruvian Mission to the Moon Needs Your Support. Here is a link to the PDF version of the image file below. 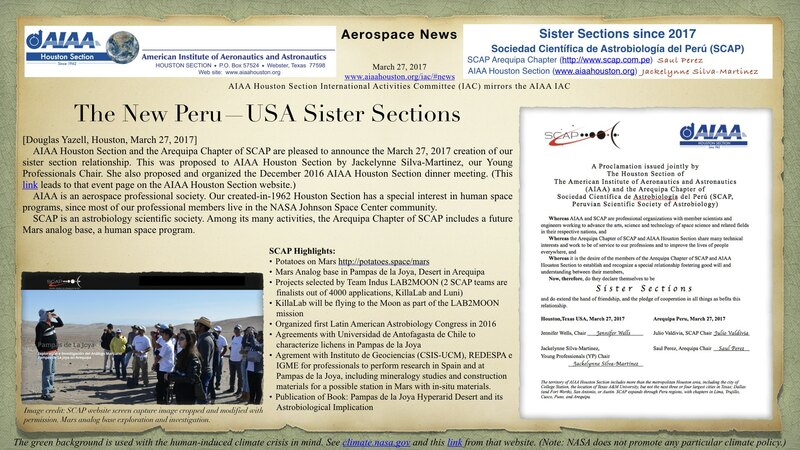 Note: AIAA Houston Section now (since 2017) is a sister section with the Arequipa chapter of SCAP, an astrobiology scientific society in Peru (http://www.scap.com.pe). Here is a link to the news article below announcing the 2017 creation of our Peru-USA sister sections. [2017 03 28] Published here March 28, 2017. ESA’s Jupiter Mission Moves Off the Drawing Board. [ESA, March 16, 2017]. Also; We start our celebration of the 10-year anniversary of our since-2007 France-USA sister section partnership. Here is a link to the PDF version of the JPEG image below. [2017 03 27] Published here March 27, 2017. The New Peru—USA Sister Sections. AIAA Houston Section and Sociedad Científica de Astrobiología del Perú (SCAP). Here is a link to the PDF version of the JPEG image below. [2017 03 19] Published here March 19, 2017. 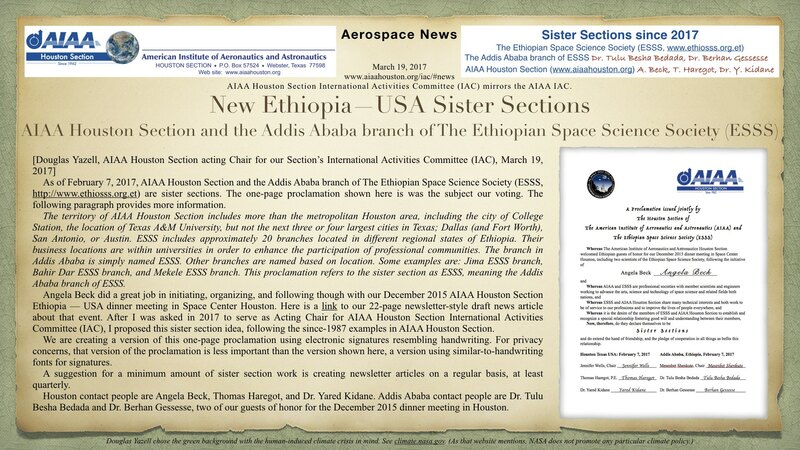 New Ethiopia—USA Sister Sections; AIAA Houston Section and the Addis Ababa branch of The Ethiopian Space Science Society (ESSS). Here is a link to the PDF version of the JPEG image below. [2017 03 18] Published here March 18, 2017. 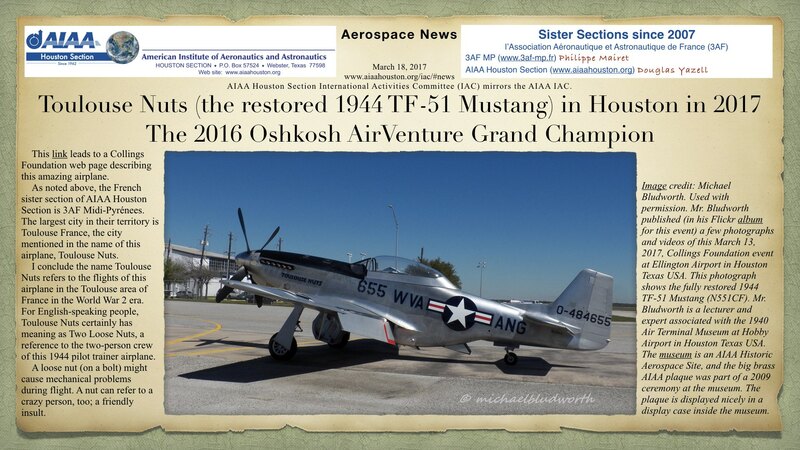 Toulouse Nuts (the restored 1944 TF-51 Mustang) in Houston in 2017; The 2016 Oshkosh AirVenture Grand Champion. Here is a link to the PDF version of the JPEG image below. [2017 03 01] Published here March 1, 2017. 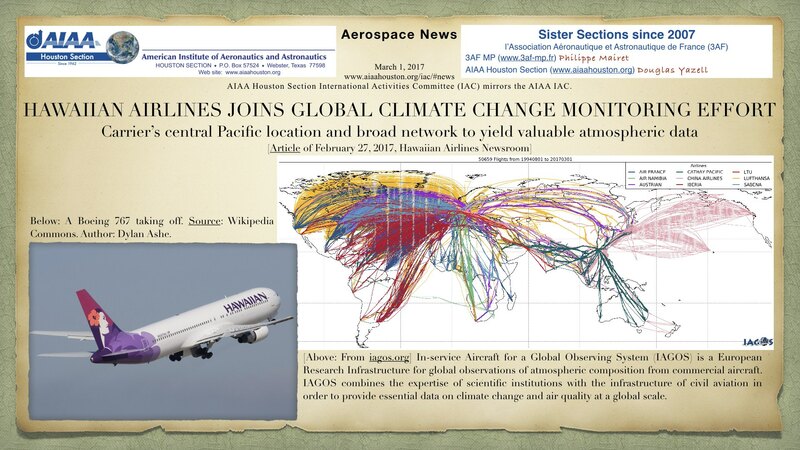 Above: Hawaiian Airlines Joins Global Climate Change Monitoring Effort. Here is a link to the pdf version of the JPEG image below. [2017 01 26] Published here January 26, 2017. The Space Program of China. Here is a link to the PDF version of the JPEG image below. [2017 01 09] Published here January 9, 2017. 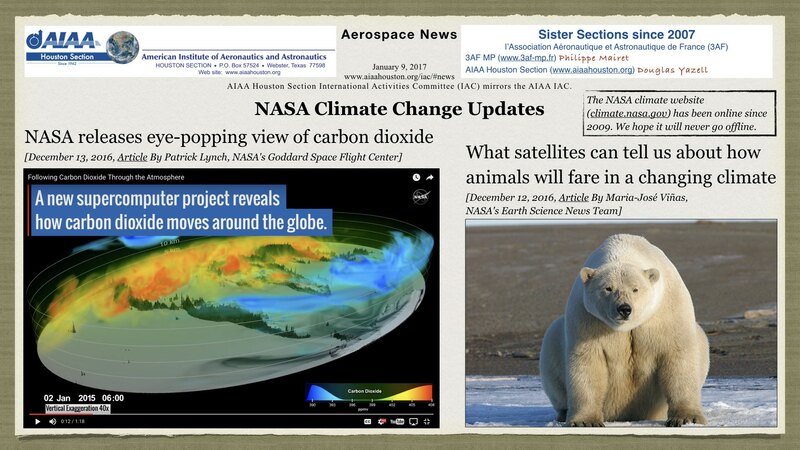 NASA Climate Change Updates. Here is a link to the PDF version of the JPEG image below. [2016 12 22] Published here December 22, 2016. 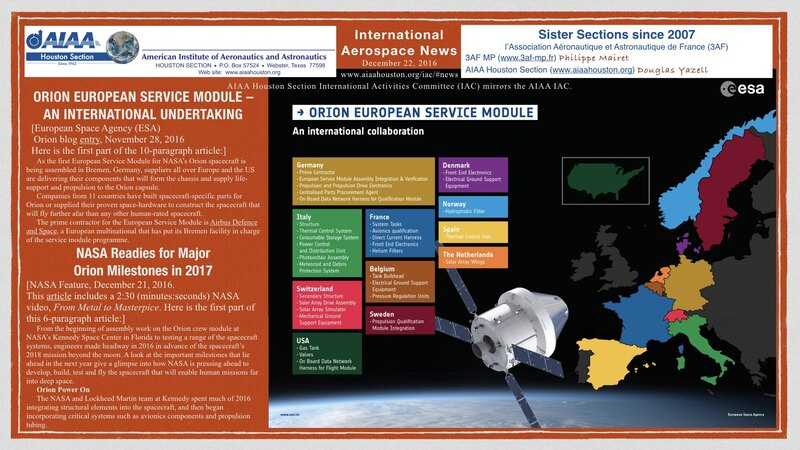 ORION EUROPEAN SERVICE MODULE – AN INTERNATIONAL UNDERTAKING [European Space Agency (ESA), Orion blog entry, November 28, 2016], and NASA Readies for Major Orion Milestones in 2017 [NASA Feature, December 21, 2016]. [2016 12 19] Published here December 19, 2016. NASA Science Chief Discusses Plans, Earth Science Mission. From AIAA Daily Launch, Scientific American, December 16, 2016. Here is a link to the PDF version of the JPEG image below. [2016 12 17] Published here December 17, 2016. NASA’s First Flight With Crew Will Mark Important Step on Journey to Mars [NASA article, December 1, 2016]. Here is a link to the PDF version of the JPEG image below. 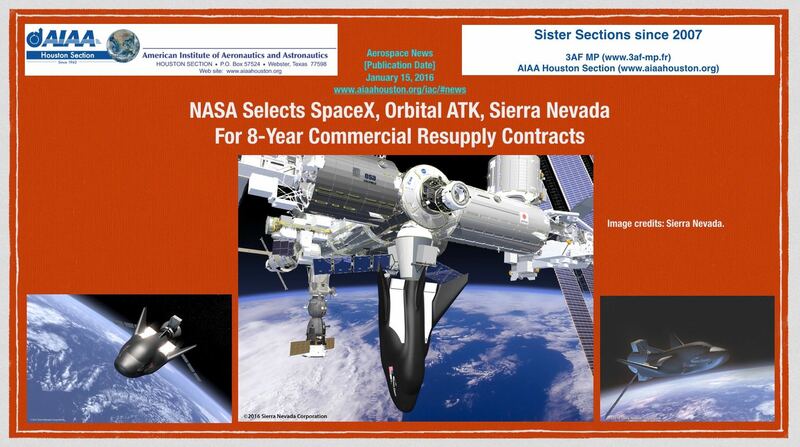 We added this article at the last minute: International Partnership with Europe Extended for Space Station, Orion. [NASA article, December 5, 2016]. We also added an Editorial article by Douglas Yazell talking about the use of the word Manned in aerospace, even in the acronym UAV (Unmanned Aerial Vehicles). [2016 12 13] Published here December 13, 2016. 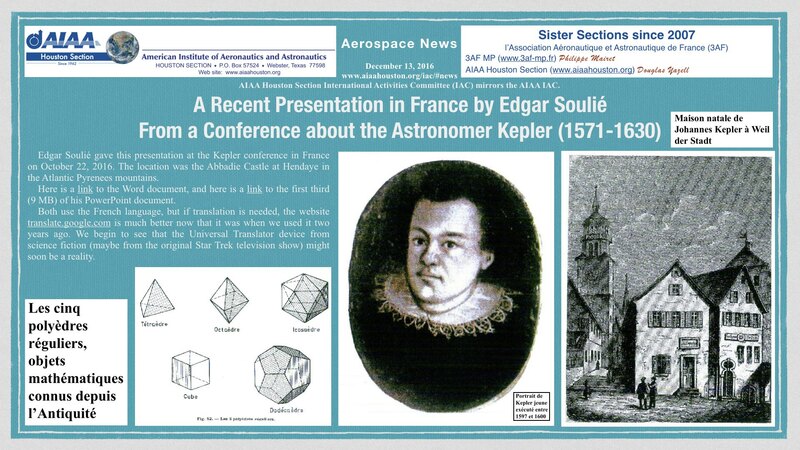 A Recent Presentation in France by Edgar Soulié, From a Conference about the Astronomer Kepler (1571-1630). Here is a link to the PDF version of the JPEG image below. [2016 12 09] Published here December 9, 2016. 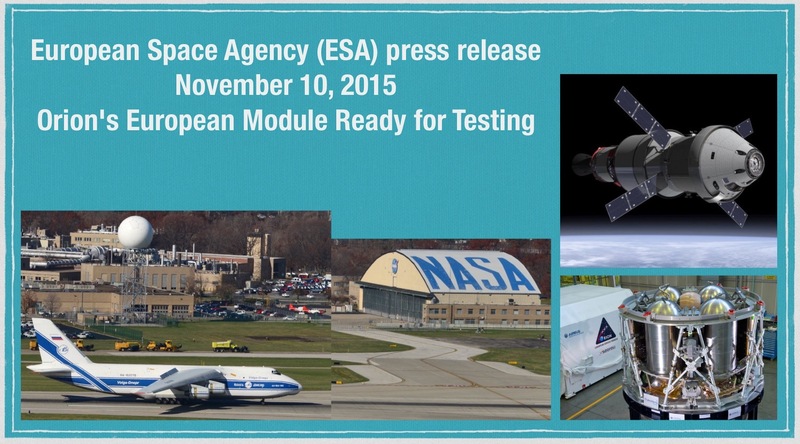 ESA to Supply Service Module for First Crewed Orion Mission. Here is a link to the PDF version of the JPEG image below. [2016 12 06] Published here December 6, 2016. From Clear Creek Independent School District (Houston Texas USA) to Collège (Montalembert – Les Maristes, Toulouse France). Here is a link to the PDF version of the JPEG image below. [2016 12 01] Published here December 1, 2016. 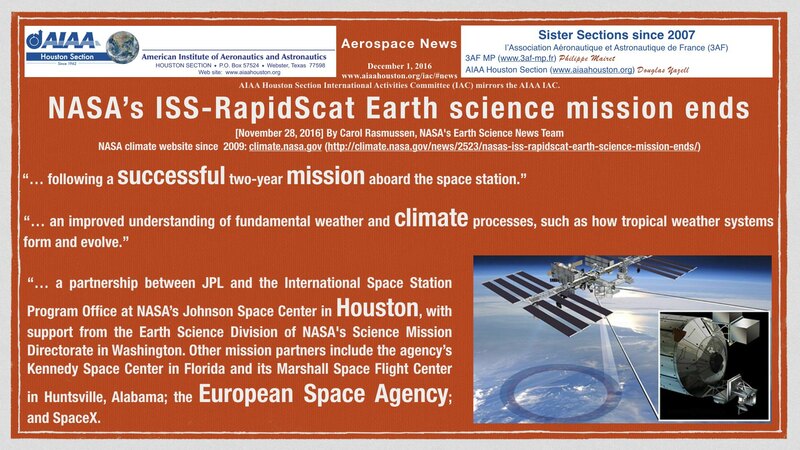 NASA’s ISS-RapidScat Earth science mission ends. Here is a link to the PDF version of the JPEG image file below. Advanced Weather Watcher in Orbit. [NASA Feature, November 19, 2016. 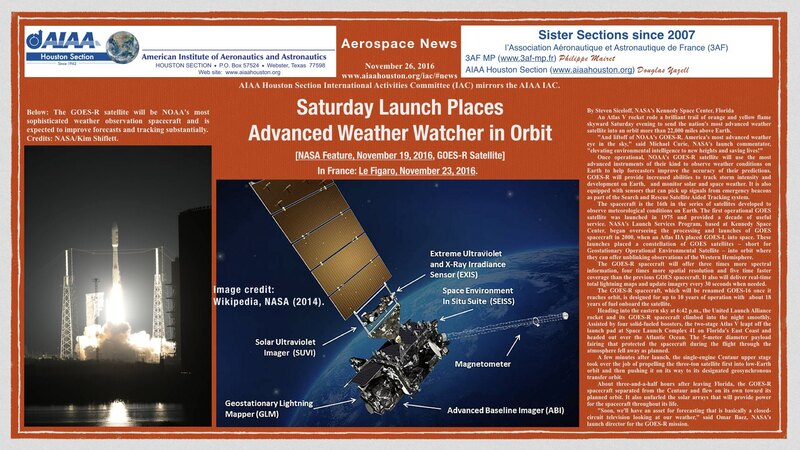 GOES-R Satellite] Here is a link to the PDF version of the JPEG image file below. [2016 11 27] Published here November 27, 2016. 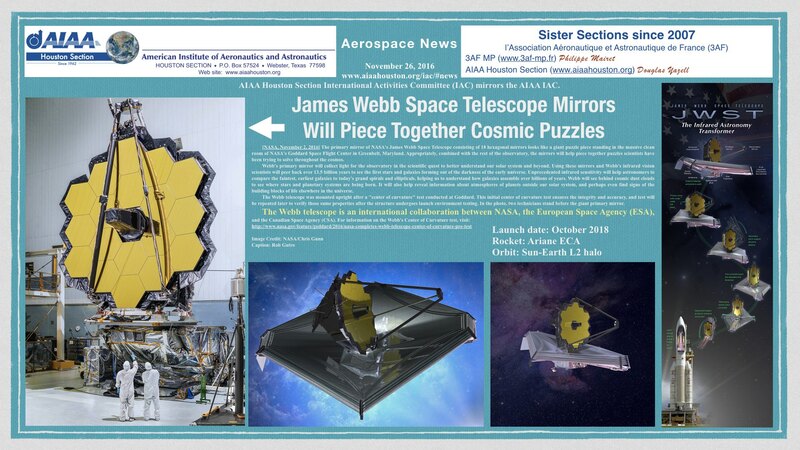 James Webb Space Telescope Mirrors Will Piece Together Cosmic Puzzles. [NASA, November 2, 2016] Here is a link to the PDF version of the image below. [2016-11 27] Published here November 27, 2016. 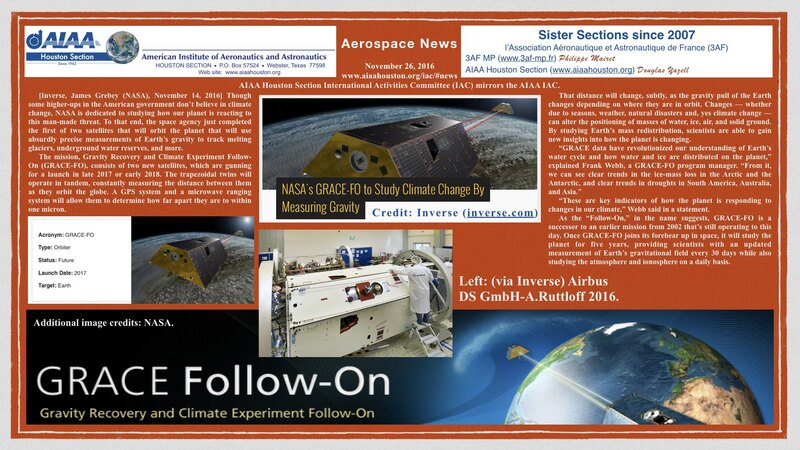 NASA’s Grace-FO to Study Climate by Measuring Gravity. [Inverse, James Grebey (NASA), November 14, 2016.] Here is a link to the PDF version of the JPEG image below. [2016 11 26] Published here November 26, 2016. 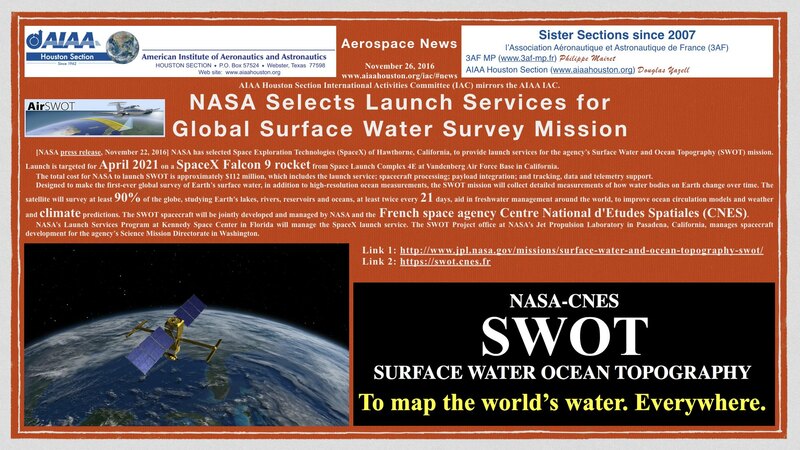 NASA Selects Launch Services for Global Surface Water Survey Mission. Here is a link to the PDF version of the JPEG image below. 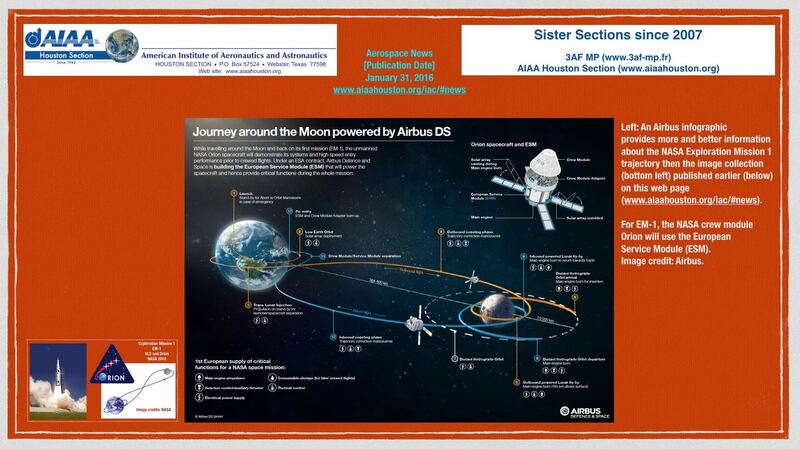 In the PDF version, the AIAA Houston Section logo and the AirSWOT image are hyperlinked. Acronyms: Surface Water and Ocean Topography (SWOT). 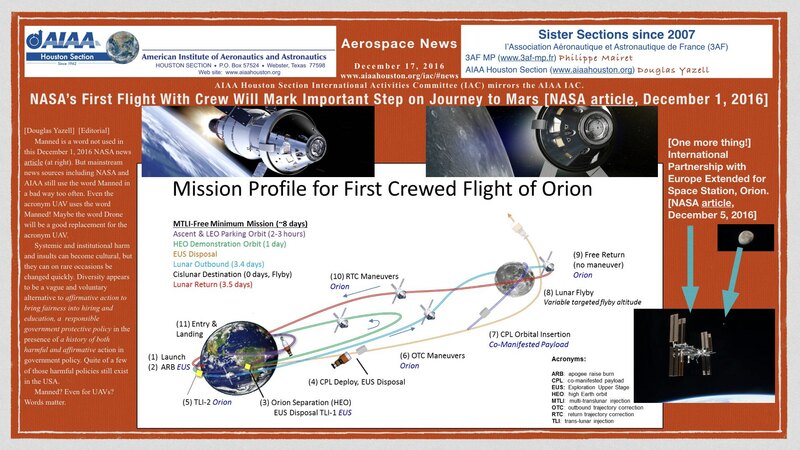 AirSWOT refers not to the space-based mission but the prior aviation-based mission. [2016 11 24] Published here November 24, 2016. 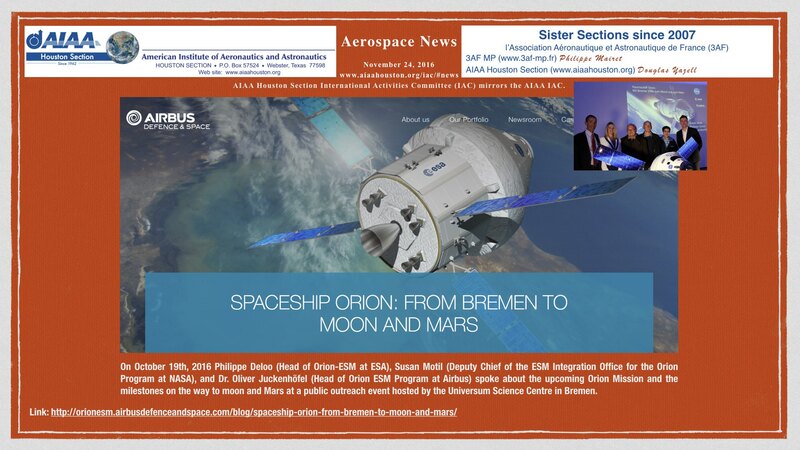 Spaceship Orion: From Bremen Germany to Moon and Mars. Here is a link to the PDF version of the JPEG image below. [2016 11 24] Published here November 24, 2016. 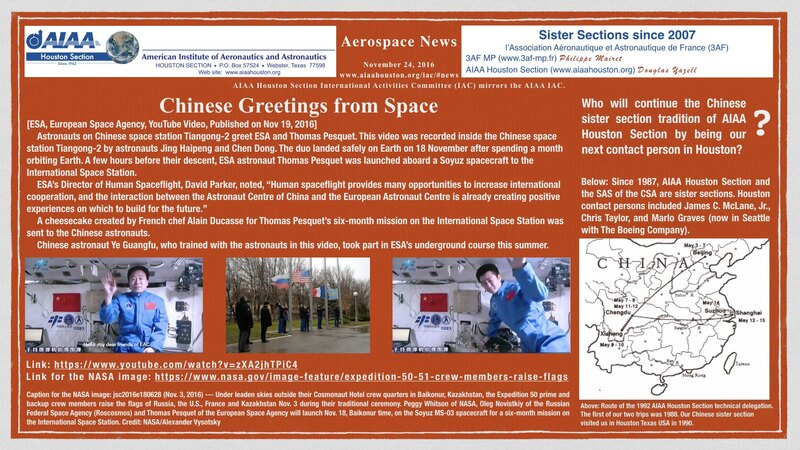 Chinese Greetings from Space. Here is a link to the PDF version of the JPEG image below. Above: Chinese Astronauts Return To Earth Aboard Shenzhou 11 Capsule. [2016 11 19] Published here November 19, 2016. 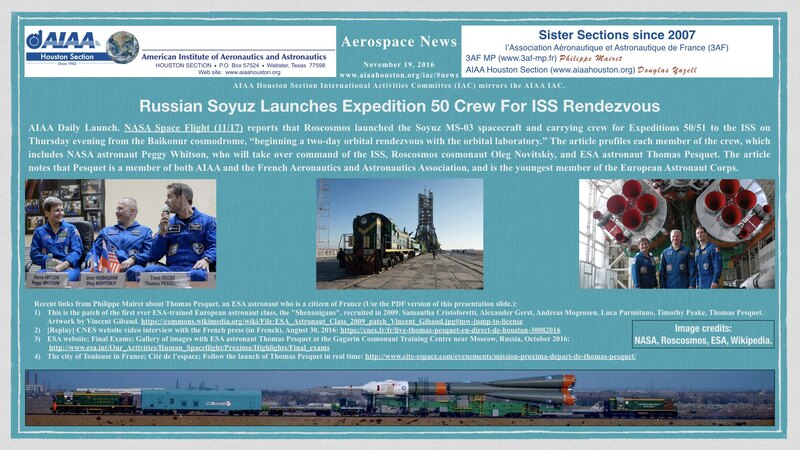 Russian Soyuz Launches Expedition 50 Crew For ISS Rendezvous [November 17, 2016, NASASpaceFlight.com], from AIAA Daily Launch. 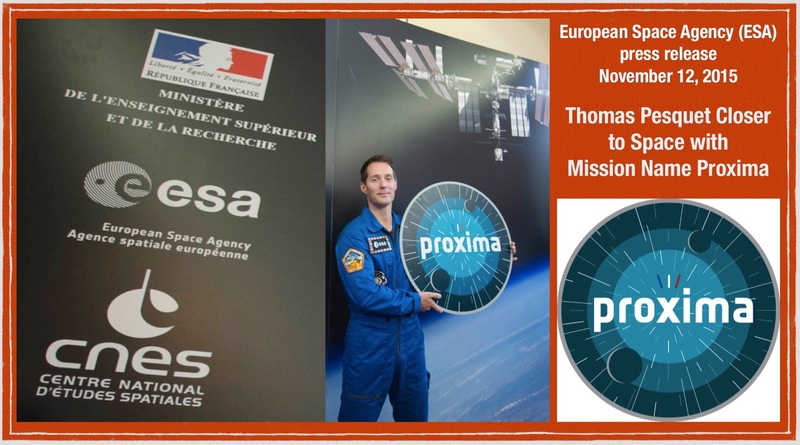 The 3-person crew includes ESA astronaut Thomas Pesquet, a citizen of France. Here is a link to the PDF version of the presentation slide below. [2016 11 07] Published here November 7, 2016. 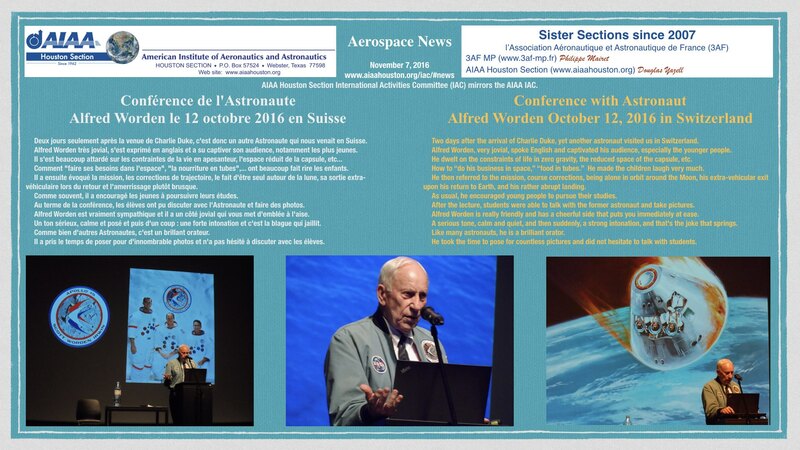 Conference with Apollo 15 Astronaut Alfred Worden October 12, 2016 in Switzerland. Here is a link to the PDF version of the JPEG image below. [2016 09 05] Published here September 5, 2016. 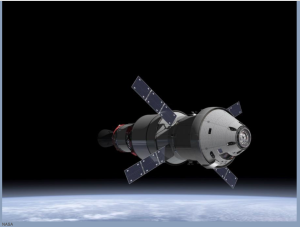 Orion, the new European and American Spacecraft. Date: October 5, 2016. Time: 6:30 PM. Place: Cité de l’espace, Toulouse France. 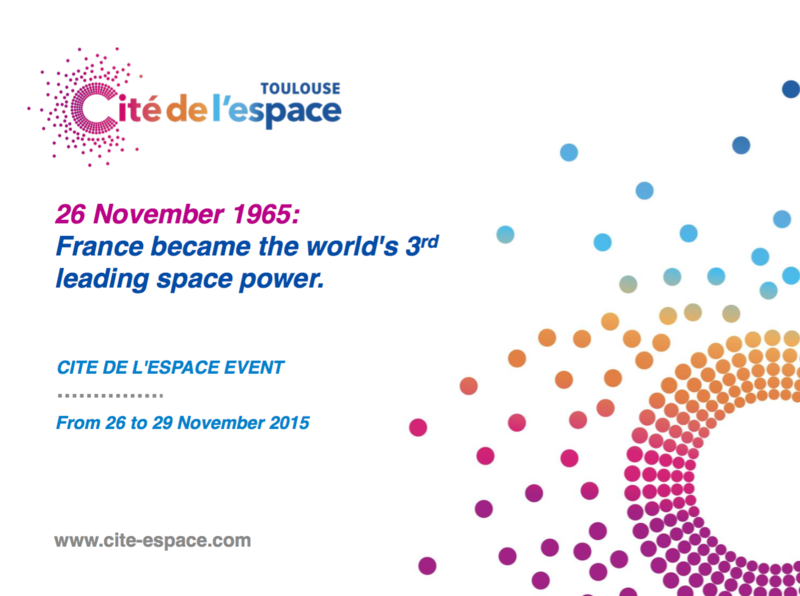 Here is the Cité de l’espace event link. “The event was a success : more than 80% of IMAX room was full of participants. There was one speaker, Mr Jean-Luc Bonnaire, Airbus Defence and Space Les Mureaux, Deputy Director of Orion Program. Jean-François Clervoy, ESA Astronaut, Emeritus 3AF and AIAA Senior member, testified of his experience of spaceflight. propulsion, etc …), he showed photos of Plum Brook and Bremen installations with models, etc…). Airbus Defence and Space appeared to be the Prime on the ESA (European Space Agency) side. Thales Alenia Space (Torino, Italia) played also an important role. 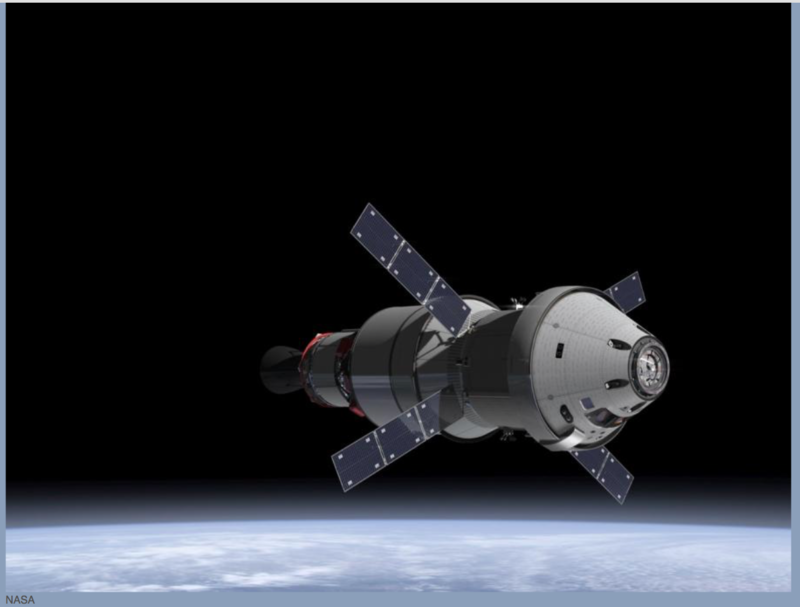 Above: Orion, the New European and American Spacecraft. Date: October 5, 2016. Time: 6:30 PM. Place: Cité de l’space, Toulouse France. (Click to zoom on this JPEG (427 KB) image.) The PDF version (1.7 MB, with working hyperlinks) of this image is available here. [2016 09 03] Published here September 3, 2016 (three headlines). [August 31, 2016] From education@jpl.nasa.gov. 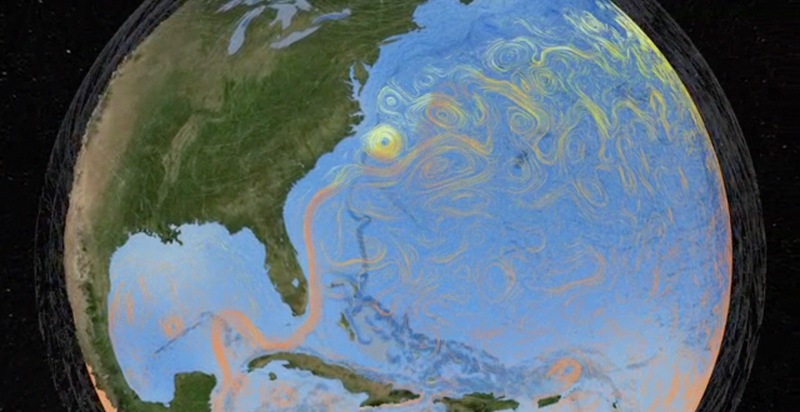 Climate change is a hot topic and one that’s become a key part of science education. 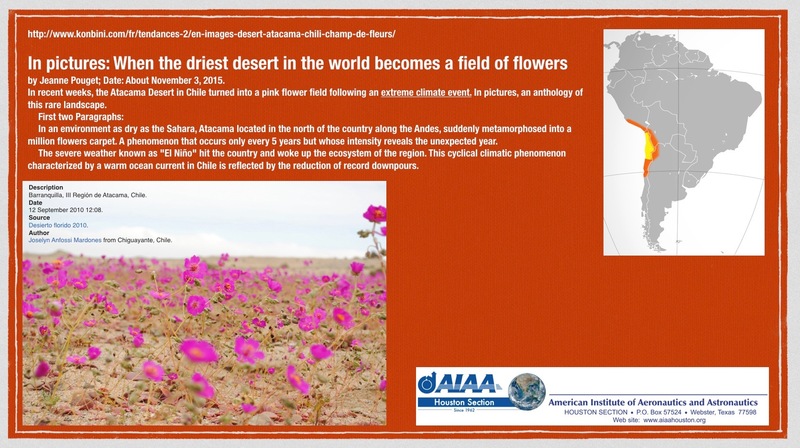 Introduce students to NASA’s climate-science research and Earth satellites with a free bulletin board from the Educator Resource Center at NASA’s Jet Propulsion Laboratory. The set of posters, lithographs and stickers helps visually engage students while teaching them about topics such as sea-level rise, clouds and greenhouse gases. Learn more and see a list of the materials featured in the bulletin board, here. To request your free bulletin board, email Paula Partida in the JPL Educator Resource Center. Please include the school or educational program, grade-level taught and a mailing address in your email. Materials are available on a first-come-first-served basis. Note: Our Solar System and Mars Bulletin Board materials are now out of stock. To download and print out the resources, go here and here, and click on the links next to each product. This event consisted of free training for hundreds of volunteers whose applications were accepted. These events have taken place about twice a year around the world since 2006. The Houston 2016 venue was the Hilton Americas Houston hotel in downtown Houston Texas USA. [2016 08 31] Published here August 31, 2016. Rest in Peace, James “Jim” Duncan Rendleman, 1956 – 2016, AIAA IAC member since 2007. 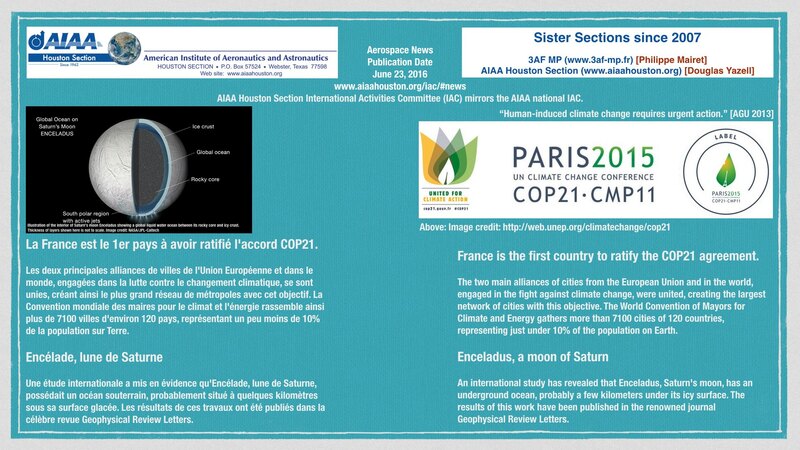 The three issues of the newsletter used in the image below are September 2012, December 2012, and June 2013. [2016 08 24] Published here August 24, 2016. 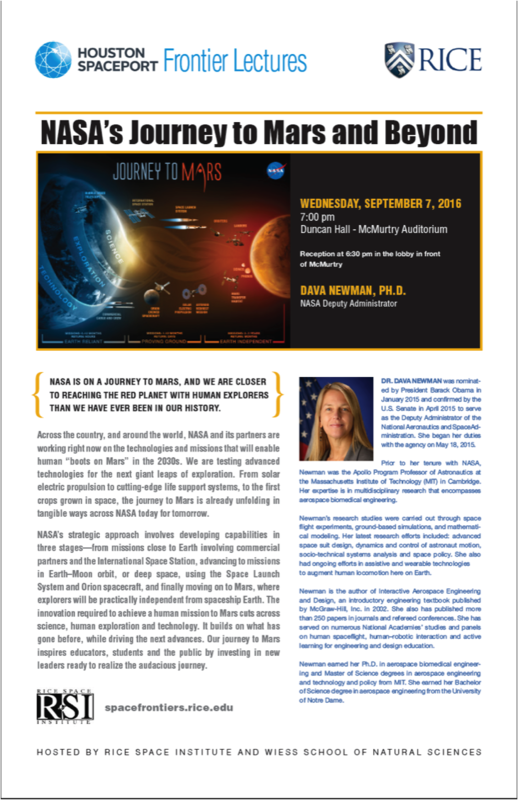 NASA’s Journey to Mars and Beyond, by Dava Newman, PhD, NASA Deputy Administrator, at Rice University, September 7, 2016. [2016 08 23] Published here August 23, 2016. 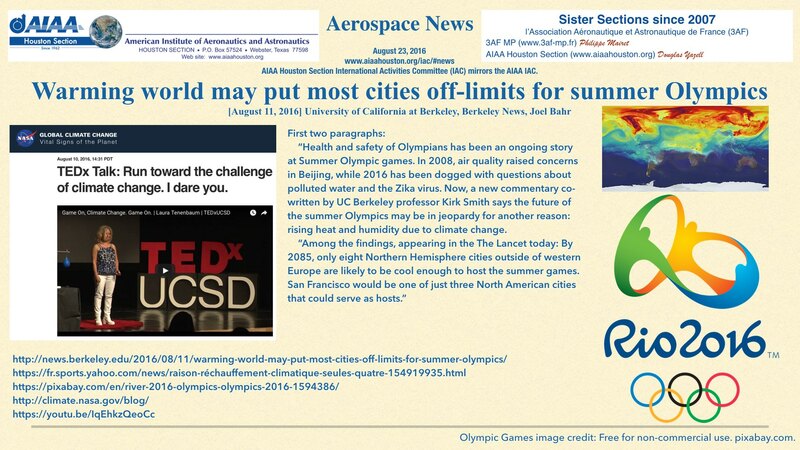 Warming world may put most cities off-limits for summer Olympics [August 11, 2016] University of California at Berkeley, Berkeley News, Joel Bahr. “Health and safety of Olympians has been an ongoing story at Summer Olympic games. In 2008, air quality raised concerns in Beijing, while 2016 has been dogged with questions about polluted water and the Zika virus. Now, a new commentary co-written by UC Berkeley professor Kirk Smith says the future of the summer Olympics may be in jeopardy for another reason: rising heat and humidity due to climate change. [2016 07 28] Published here July 28, 2016. 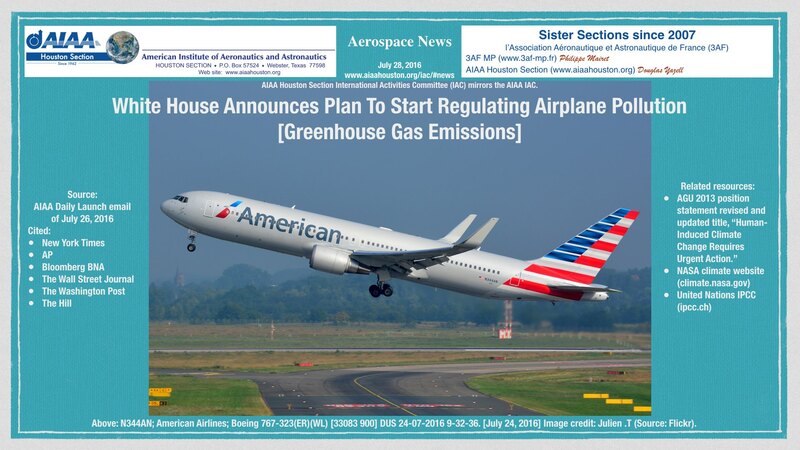 White House Announces Plan To Start Regulating Airplane Pollution [Greenhouse Gas Emissions]. 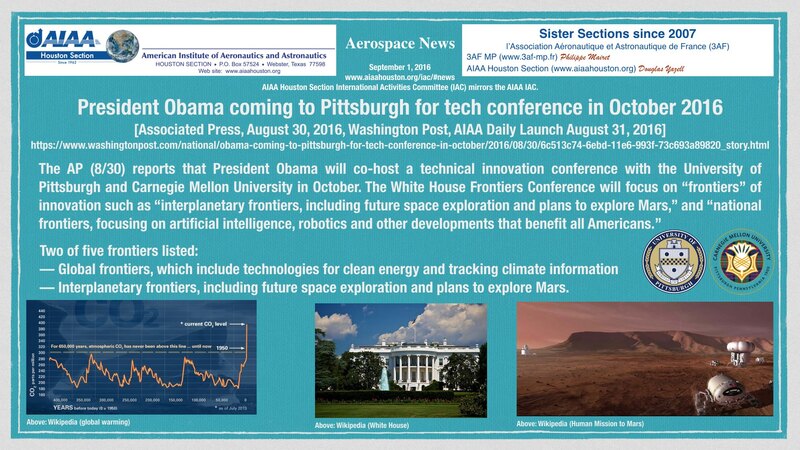 Source: AIAA Daily Launch of July 26, 2016. The Wall Street Journal (7/25, Subscription Publication) reports that the EPA said that it would coordinate any new regulation with the International Civil Aviation Organization (ICAO), a branch of the United Nations, although on Monday the agency indicated it could adopt standards that are even stronger than global standards currently used by the ICAO. 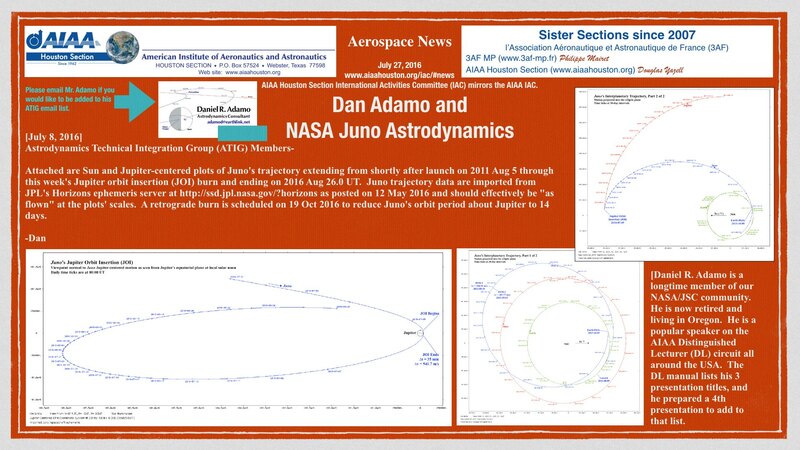 Dan Adamo regularly publishes such astrodynamics trajectory plots and related data for his Astrodynamics Technical Integration Group (ATIG) email distribution list. A selection of those eye-catching and easily understood plots are a perfect fit for publication here, and we can link to his related text documents. Mr. Adamo encourages email contact from anyone wishing to be added to his ATIG email list. His email address is adamod [at] earthlink.net. [2016 07 07] Published here July 7, 2016. 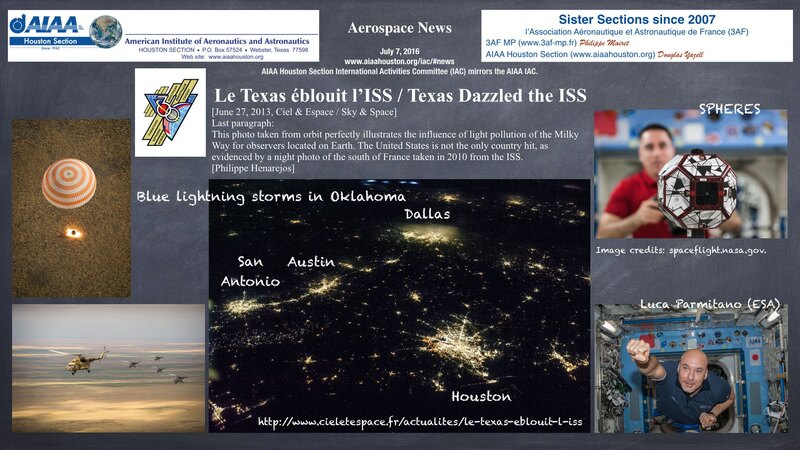 Texas Dazzles the International Space Station (ISS), a 2013 article from the French magazine Ciel & Expace (Sky & Space). Light pollution prevents far too many people from seeing our immense Milky Way Galaxy at night. The 2013 news article below talks about a similar NASA photograph of southern France at night taken from the ISS. Here is a link to a 2010 NASA news article of that nature. [2016 07 03] Published here July 3, 2016. 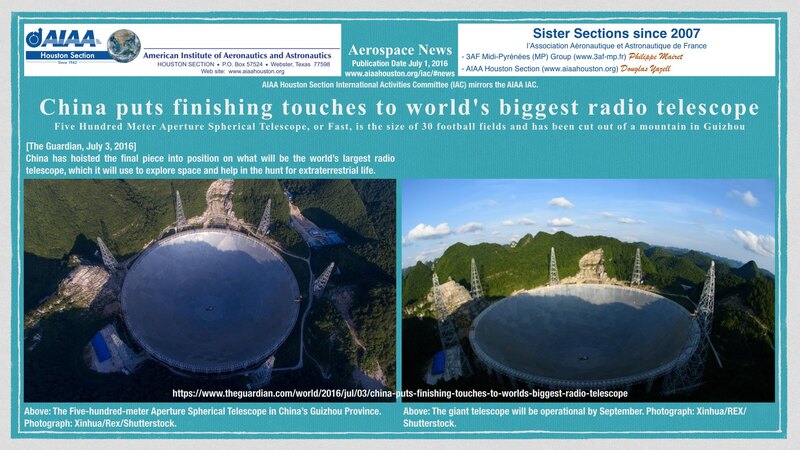 China puts finishing touches to world’s biggest radio telescope. [The Guardian, July 3, 2016] Here is a link to the article in the Guardian US. [2016 07 02] Published here July 2, 2016. Orion Notes. The NASA Multi-Purpose Crew Vehicle (MPCV), with the European Service Module. [2016 07 02] Published here July 2, 2016. Jupiter with a Crown in a new image from the Hubble Space Telescope, just before the Arrival of Juno at Jupiter. [2016 07 01] Published here July 1, 2016. 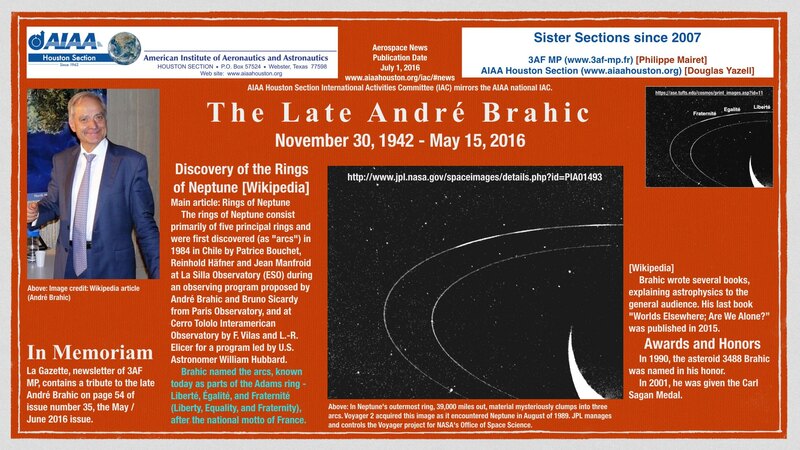 The late astrophysicist André Brahic (1942 – 2016). 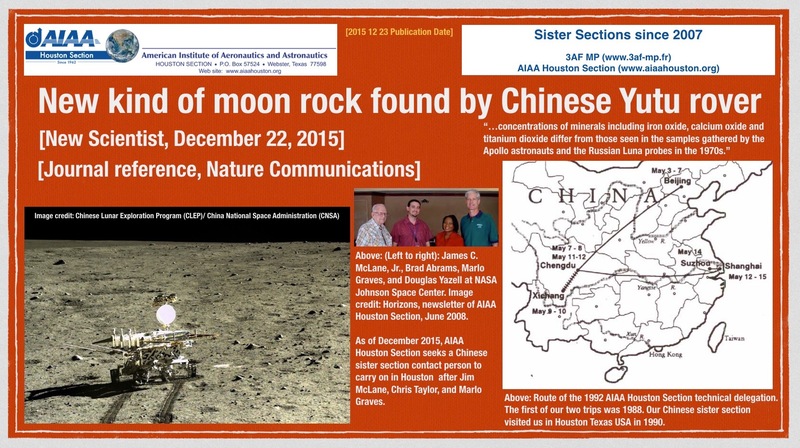 [2016 06 30] AIAA Houston Section dinner meeting of December 3, 2015. [2016 06 28] Published here June 28, 2016. 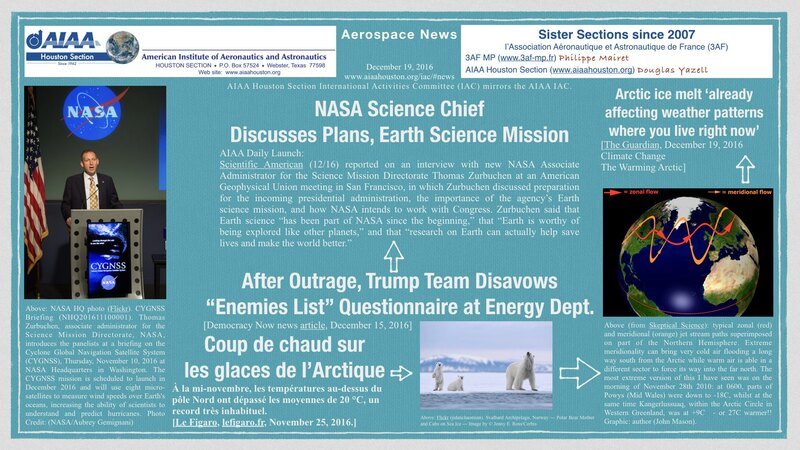 Two NASA Weather and Climate Change News Articles, including Human-Induced Climate Change, with Effects on our French-American Sister Section Territories. [2016 06 27] Published here June 27, 2016. 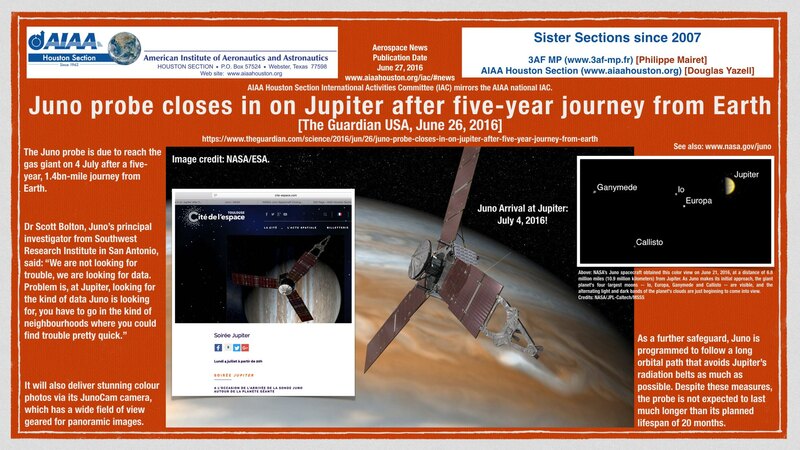 June Probe Closes in on Jupiter after Five-Year Journey from Earth [The Guardian USA, June 26, 2016]. Here is the link to the article in The Guardian USA. 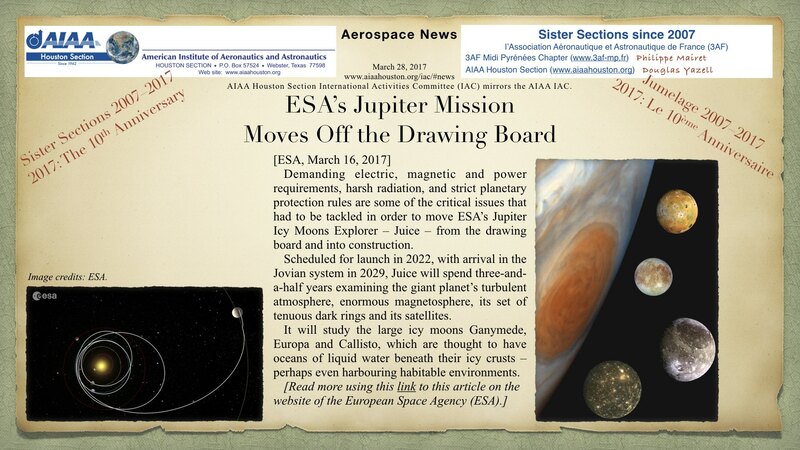 Here is the link to the NASA Juno mission website. In Toulouse France, an excellent evening celebration will take place at Cité de l’espace on July 4, 2016, Independence Day for the USA! 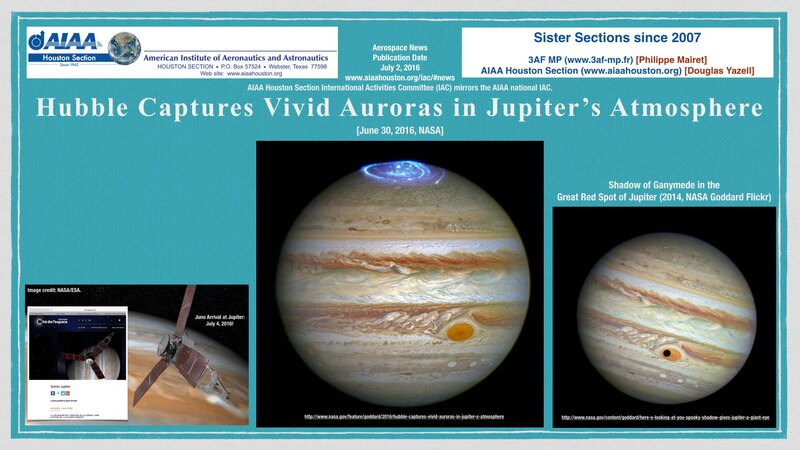 That is the date of the arrival of Juno at Jupiter. 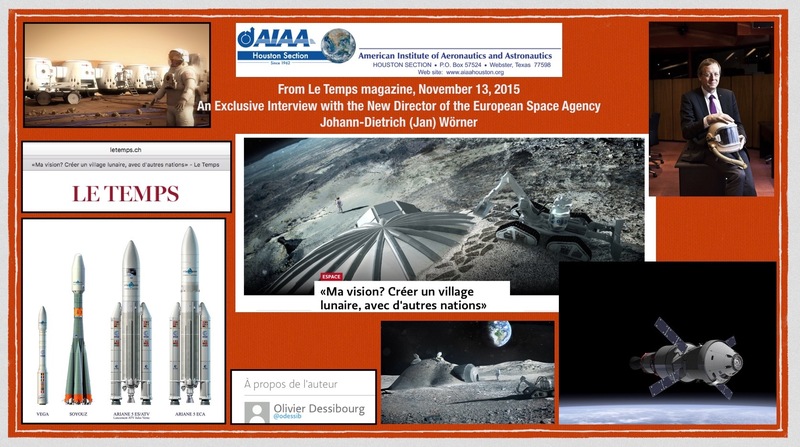 Here is the link to that article on the Cité de l’espace website. “I would like to leave you with just a few more important thoughts and considerations. We live in turbulent times. There is anger and extremism permeating our lives and political discourse. There is terror and intolerance. Values and ideals that our parents and their parents paid for in blood and tears are in peril. I submit to you that the International Space Station represents what is best in humankind. It represents engagement rather than isolation, openness rather than building walls and it is worthwhile to continue as long as we are maximizing its utilization and return, which I am convinced we can do easily until 2024. I submit to you that beyond being a technological marvel, beyond being essential in our joint endeavors to reach further into the cosmos on behalf of the human race, it represents scientific discovery and enlightenment. It represents collaboration and tolerance, inspires and motivates our children and grandchildren and provides hope. That, indeed, is a beacon for humanity and civilization. 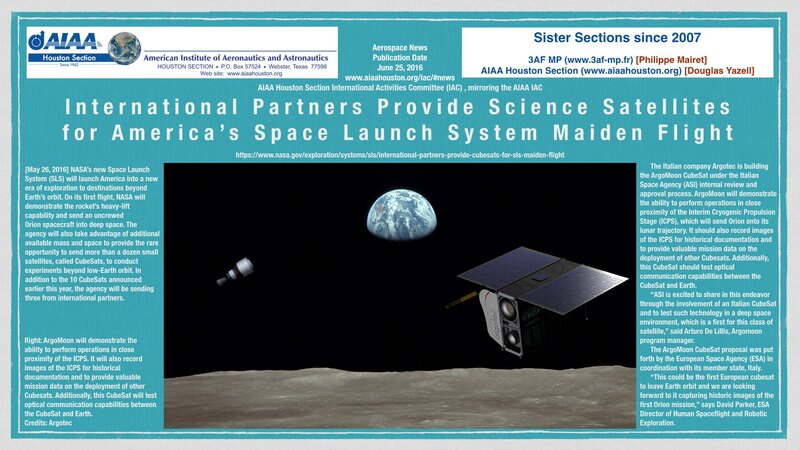 [2016 06 25] Published here June 25, 2016. International Partners Provide Science Satellites for America’s Space Launch System Maiden Flight [May 26, 2016, NASA]. Here is the link for this article on the NASA website. [2016 06 24] Published here June 24, 2016. 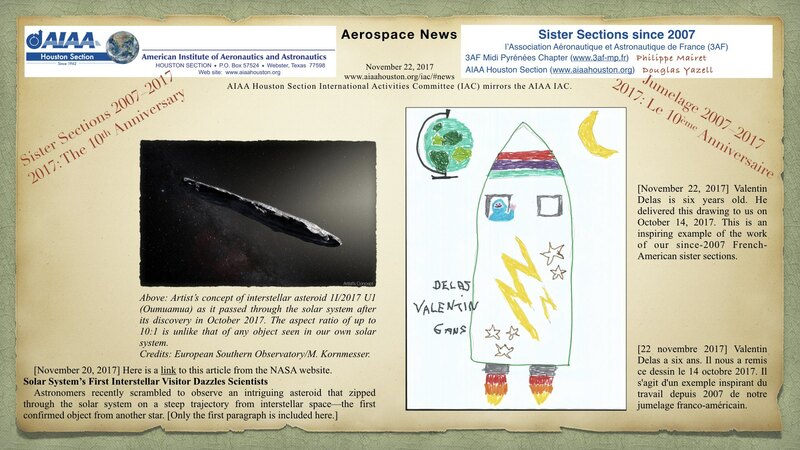 Aerospace news articles, including the ESA announcement about a deep space habitat. A related article about that deep space habitat is included in AIAA Daily Launch of June 22, 2016; the Telegraph article. [2016 06 24] Published here June 24, 2016. News of Enceladus, a Moon of Saturn. 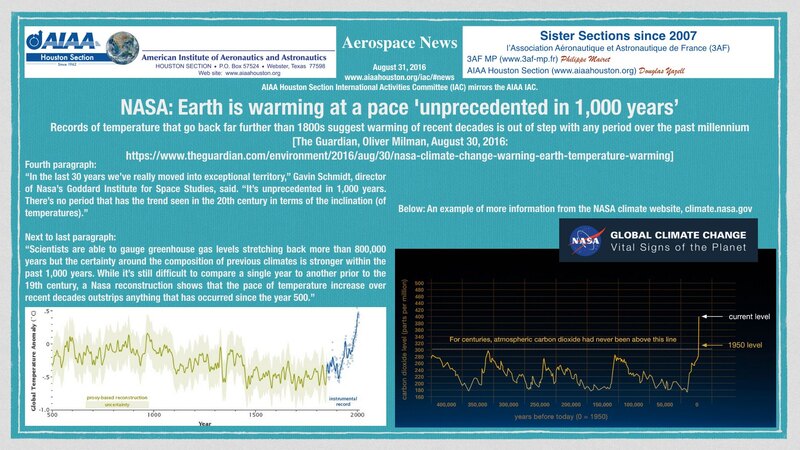 Here is a link to a NASA article [September 15, 2015.] News of the first country to ratify COP21. 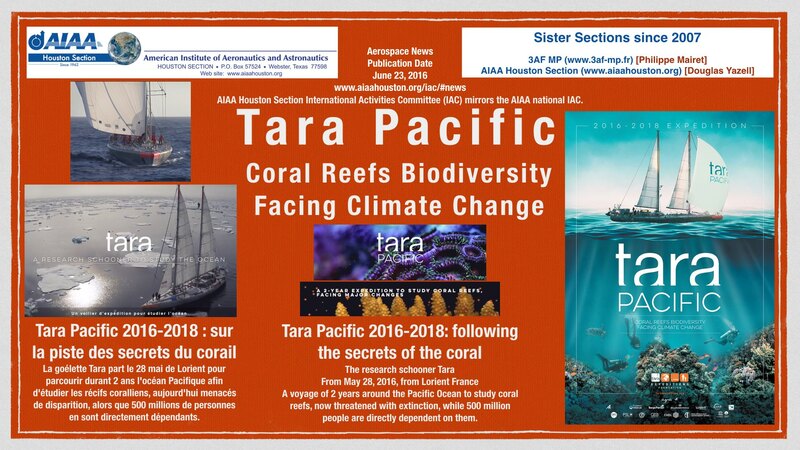 Also, here is a link to the Tara Expeditions website. [2016 06 23] Published here June 23, 2016. Small Asteroid is Earth’s Constant Companion. [NASA/JPL-Caltech, June 20, 2016]. Here is a link to the online article on the NASA/JPL-Caltech website. 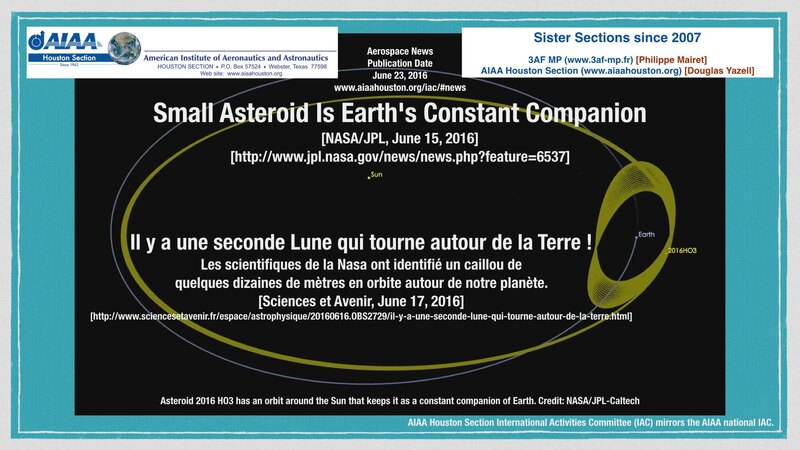 The French magazine Sciences et Avenir published a related article on June 17, 2016. Here is the link to that online article. “Satellite readings show that atmospheric methane and carbon dioxide are continuing to increase despite global efforts to reduce emissions. “Methane concentrations were somewhat constant until 2007, but since then have increased at about 0.3% per year, whereas global carbon dioxide levels continue to rise at about 0.5% per year. “The results, presented this week at the Living Planet Symposium in Prague, combine data from ESA’s veteran Envisat satellite and Japan’s GoSat mission. [2016 05 01] Published here May 1, 2016. A Visit to the City of Space, April 25, 2016, by Carla Vanier, age 11. Mr. Mairet met her and her maternal grandfather at the City of Space in Toulouse France. [2016 04 17] Published here April 27, 2016. 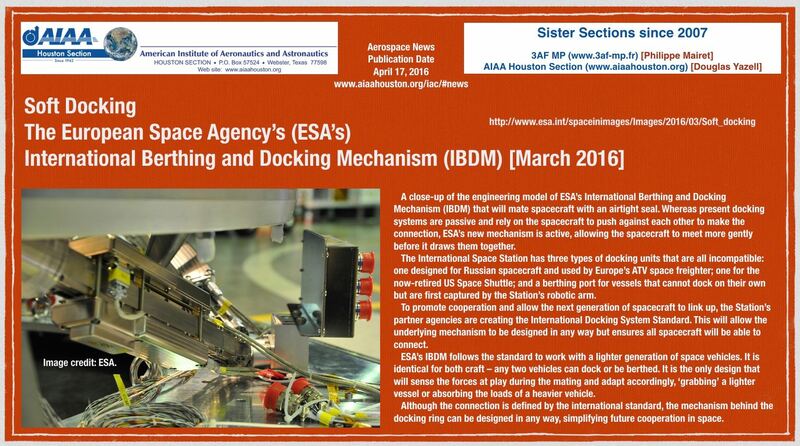 Soft Docking, ESA’s IBDM. 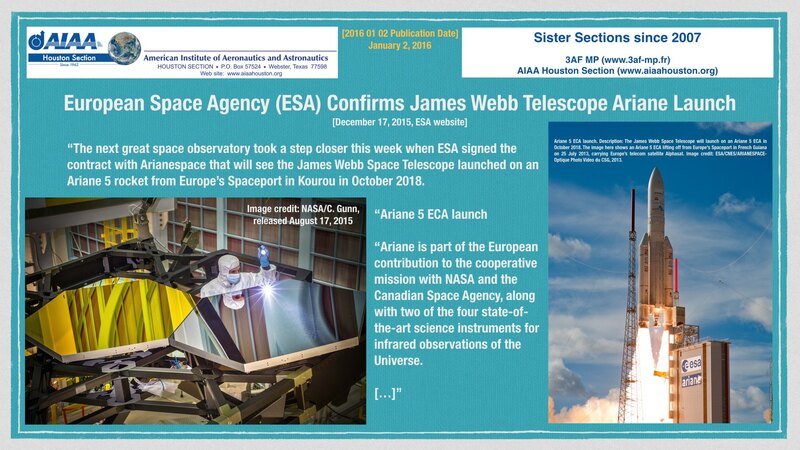 Here we provide a link to the ESA web page we used for this article. Wikipedia provides an IBDM article. The prime contractor (since June 2014) is QinetiQ Space, which mentions the IBDM in a 2015 blog entry. IBDM: International Berthing and Docking Mechanism. [2016 03 14] Published here March 14, 2016. 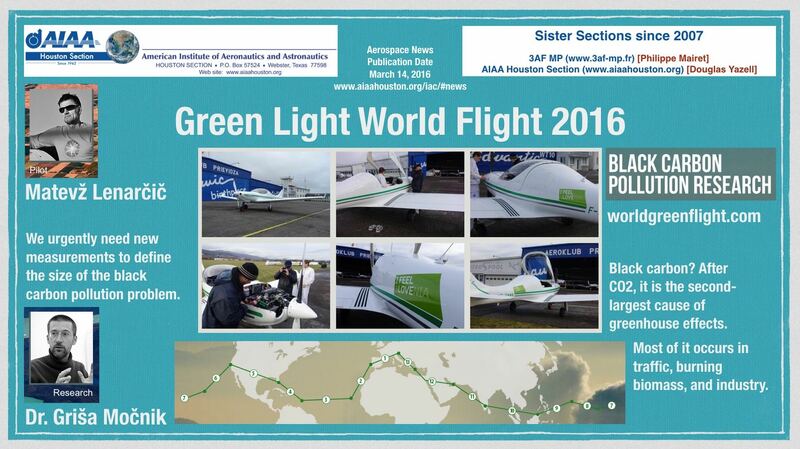 Green Light World Flight 2016. Here is the link to the web page for that excellent project. We first noticed this Aerobuzz article (in French) dated March 1, 2016. Wikipedia contains a short article about this pilot. [2016 03 10] Published here March 10, 2016. 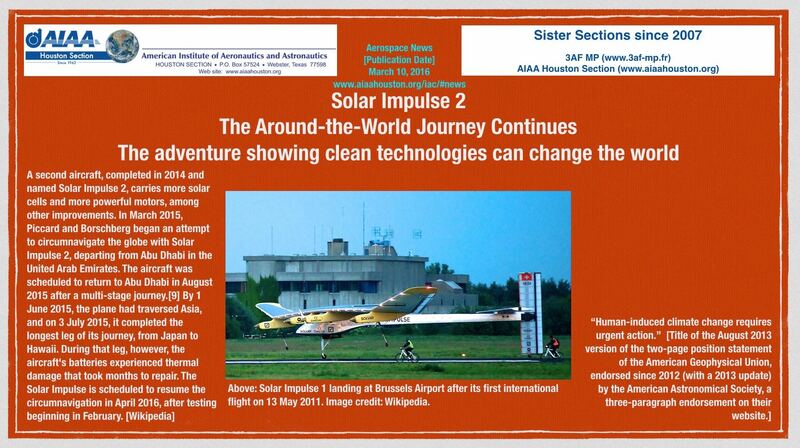 Solar Impulse 2. The Around-the-World Journey Continues. Links: The Wikipedia article link. The Solar Impulse link. [2016 02 27] Published here February 27, 2016. 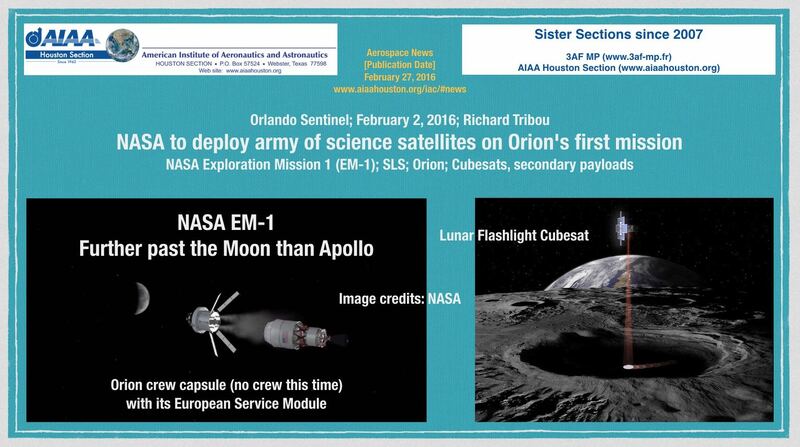 News article from the Orlando Sentinel, February 2, 2016, by Richard Tribou, NASA to Deploy Army of Science Satellites on Orion’s First Mission. Above: A news article from the Orlando Sun. Image credits: NASA. [2016 01 31] Published here January 31, 2016. 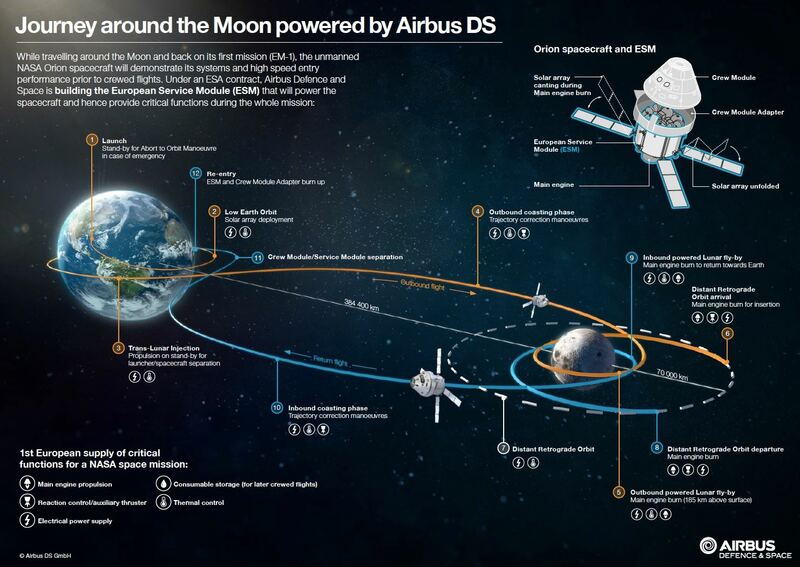 Journey around the Moon powered by Airbus DS. 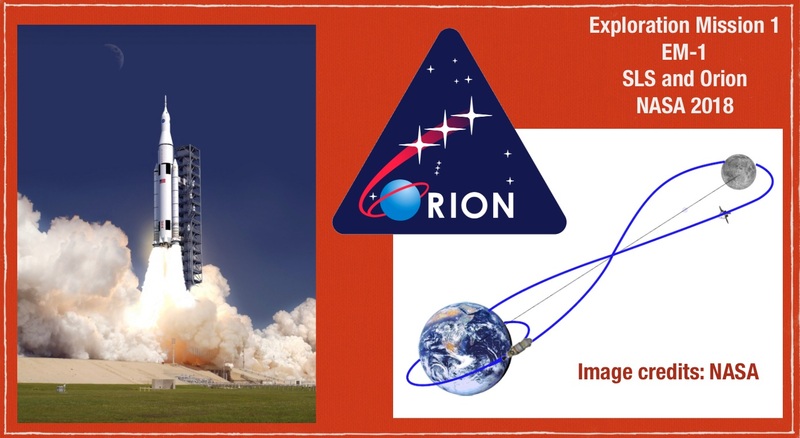 This NASA Exploration Mission 1 (EM-1) will use the European Service Module as part of the Orion crew module (Multi-Purpose Crew Module, or MPCV), along with the Space Launch System (SLS). Airbus infographic link (1.8 MB, PDF, one page). 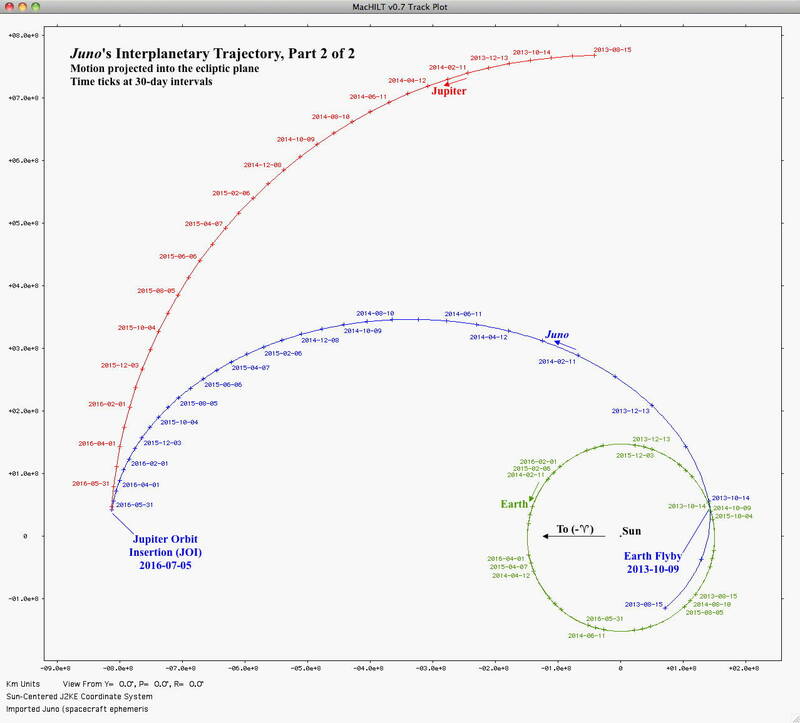 Screen capture image file link for the Airbus infographic (JPEG, 225 KB). Above: Journey around the Moon powered by Airbus DS. This NASA Exploration Mission 1 (EM-1) will use the European Service Module as part of the Orion crew module (Multi-Purpose Crew Module, or MPCV), along with the Space Launch System (SLS). Airbus infographic link (1.8 MB, PDF, one page). (Click to zoom.) Image credit: Airbus infographic, November 2015. Above: Sierra Nevada Dreamchaser. (Click to zoom.) Image credits: Sierra Nevada Corporation. [2016 01 11] Published here January 11, 2016. 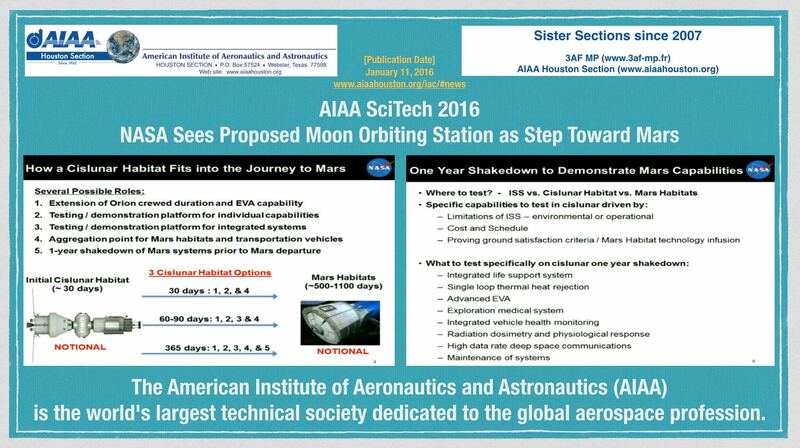 AIAA SciTech 2016: NASA Sees Proposed Moon-Orbiting Station as Step Toward Mars. [[2016 01 11] Published here January 11, 2016. 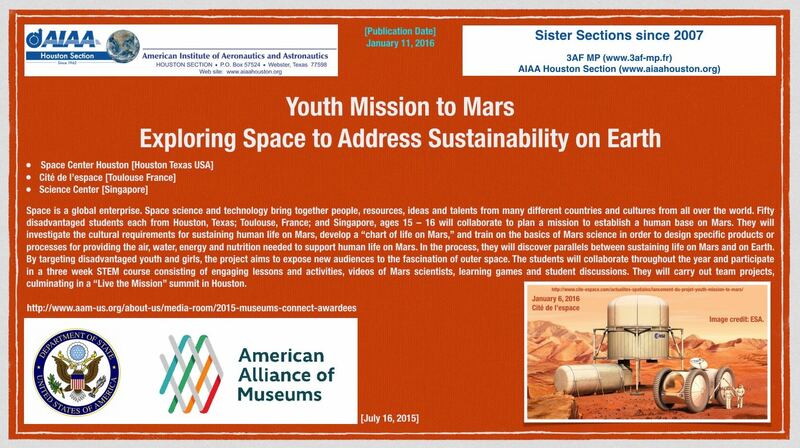 Launch of the Youth Project Mission to Mars. High school students from Toulouse France, Houston Texas USA, and Singapore are going to work together on the human challenges and necessary to implant a base camp on the red planet. [2016 01 09] Ars Technical article dated January 7, 2016. Above: ESA decides to support astronauts to the Moon first, Mars later? Reference: Ars Technica article by Eric Berger dated January 7, 2016. (Click to zoom.) 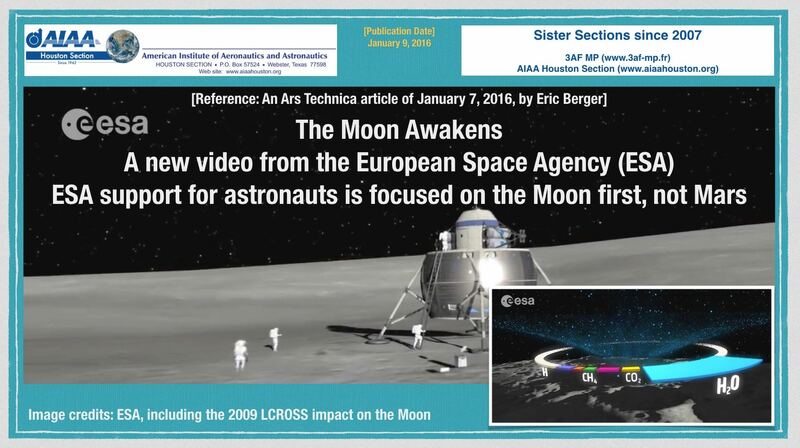 Image credits: ESA video screen capture images, The Moon Awakens. [2016 01 07] January 7, 2016 publication date. 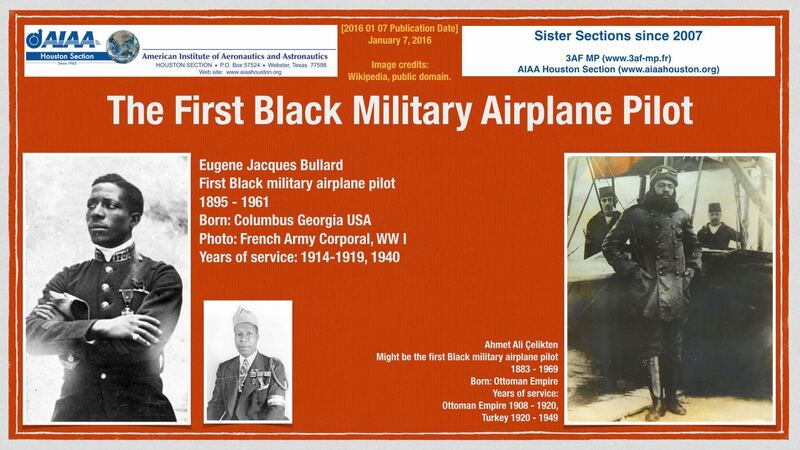 The first Black military pilot. [2015 12 22 publication date] December 22, 2105. [The Guardian] “Welcome back, baby!” Elon Musk Celebrates SpaceX Rocket Launch – and Landing. 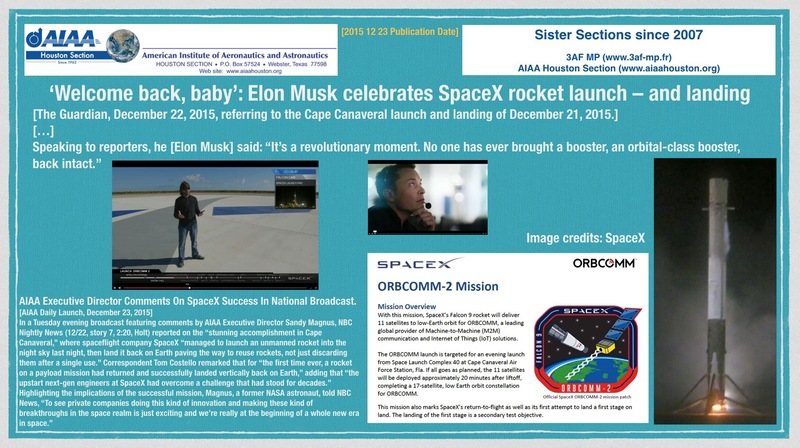 Above: The Guardian reports on the December 21, 2015 SpaceX launch and a “revolutionary” landing. (Click to zoom.) Image credits: SpaceX. [2015 12 22 publication date] December 15, 2015. 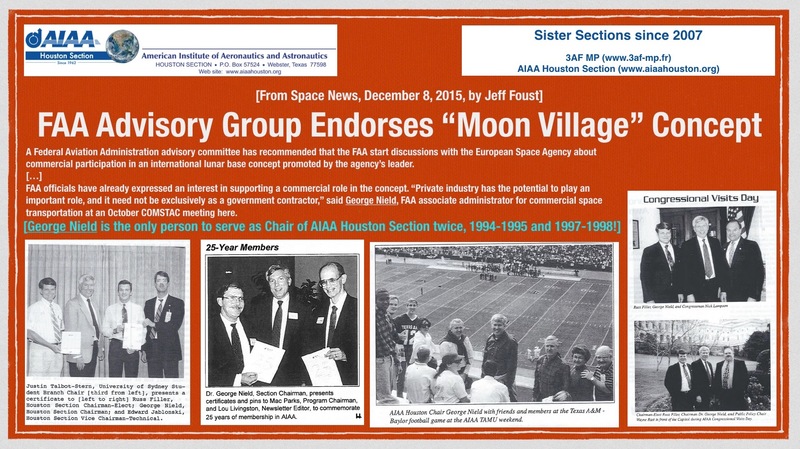 [Space News article by Jeff Foust] FAA Advisory Group Endorses “Moon Village” Concept. 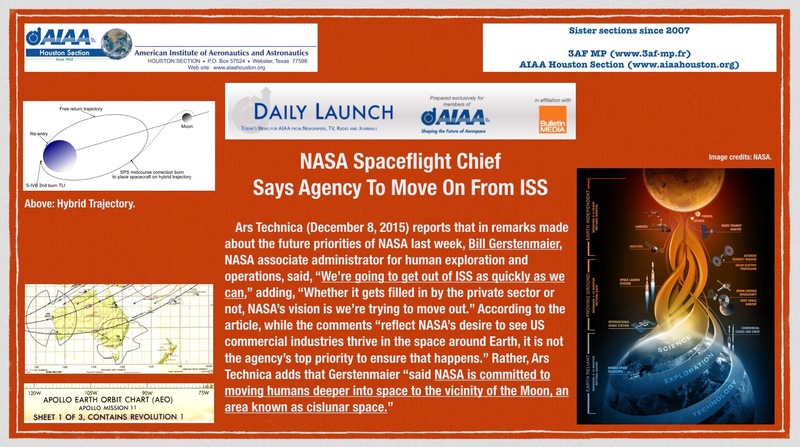 Above: Space News article by Jeff Foust. (Click to zoom.) Image credits: AIAA Houston Section. [2015 12 22 publication date] December 8, 2015. 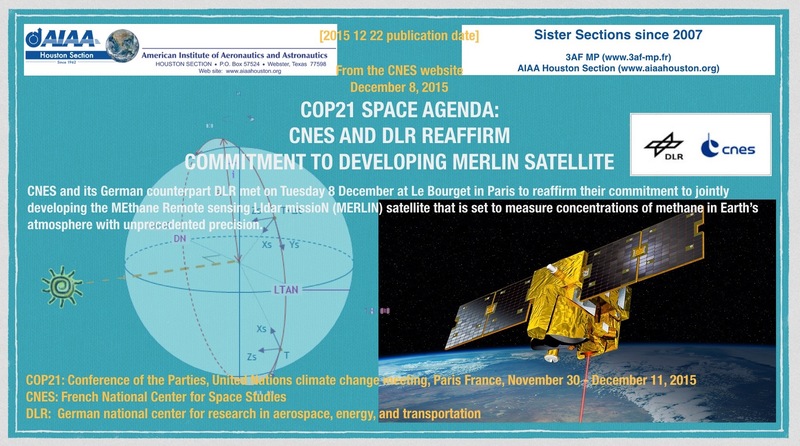 [CNES website press release] COP21 Space Agenda: CNES and DLR Reaffirm Commitment to Developing MERLIN Satellite. 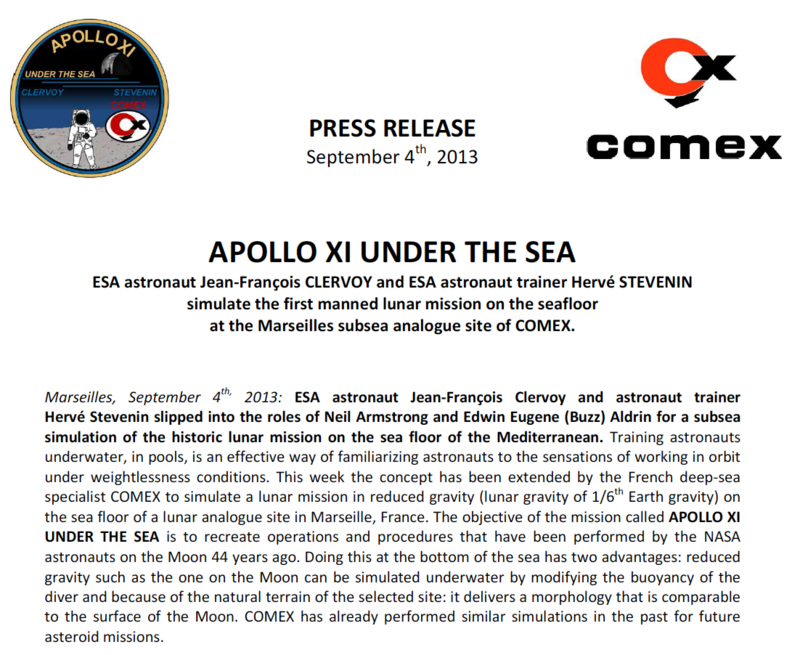 Above: CNES press release with option for English language. (Click to zoom.) 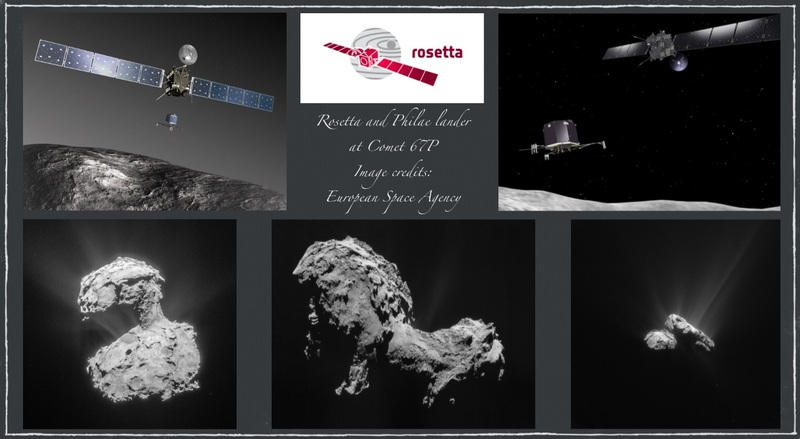 Image credits: DRL and CNES. [2015 12 14] December 14, 2015. 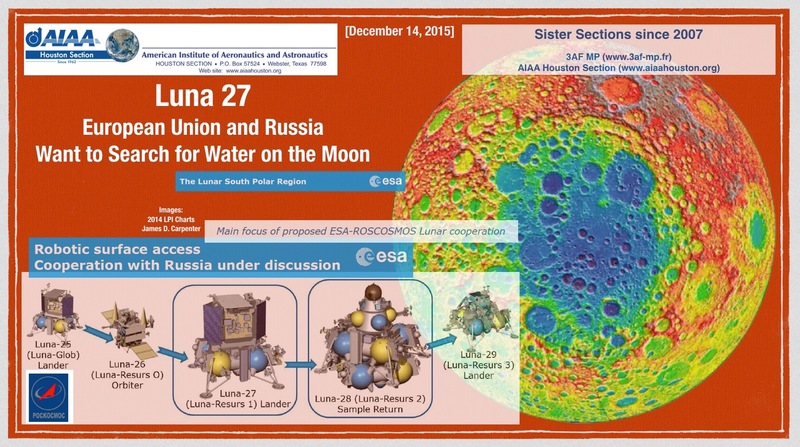 The EU and Russia Want to Search for Water on the Moon. Above: The EU and Russian want to search for water on the Moon. This headline is from an online article dated October 21, 2015. That is from a Swiss publication, BlueWin. (Click to zoom.) 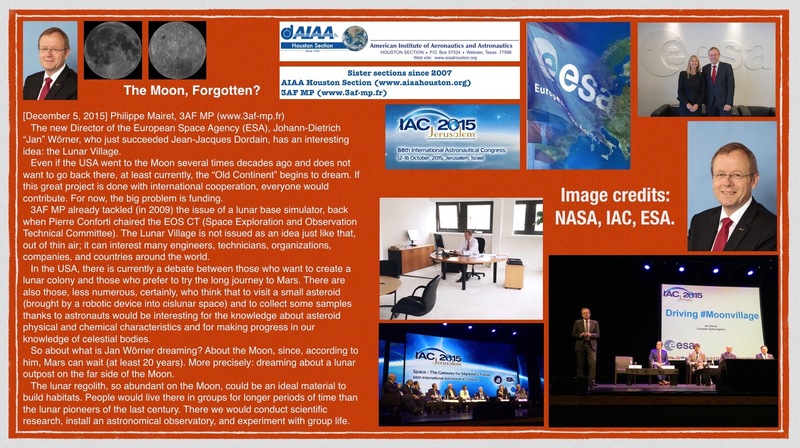 Image credits: A 2014 presentation by James D. Carpenter at the Lunar and Planetary Institute (LPI) in Houston Texas USA. [2015 12 13] December 8, 2015. 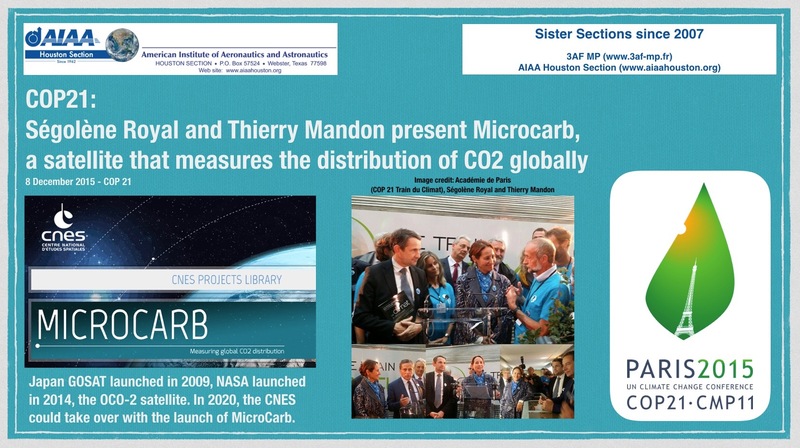 At COP21, Ségolène Royal and Thierry Mandon present MicroCarb, a Satellite that Measures the Distribution of CO2 Globally. [2015 12 12] December 7, 2015. NASA to Move On from International Space Station (ISS). Above: NASA to move on from International Space Station (ISS). (Click to zoom.) Image credits: NASA. Image link: Journey to Mars (vertical). 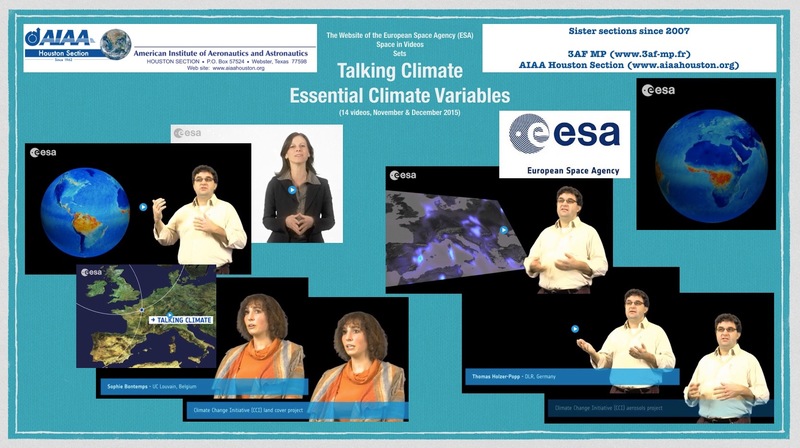 [2015 12 12] December 12, 2015: The European Space Agency (ESA), Space in Videos, Sets, Talking Climate, Essential Climate Variables, November and December 2015. 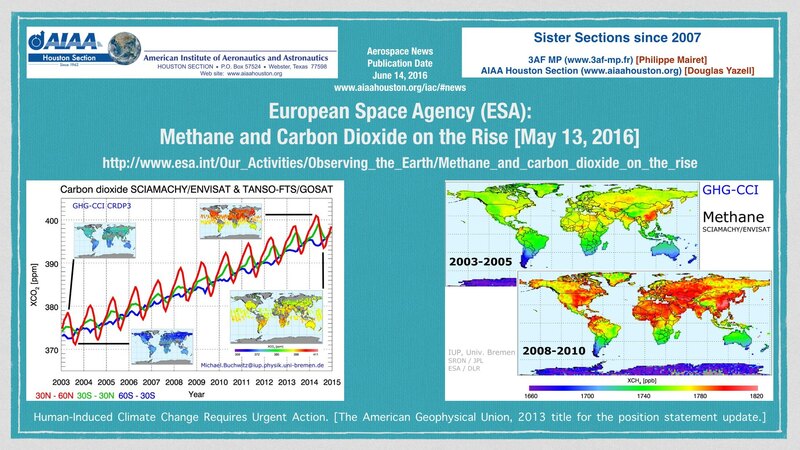 Above: The European Space Agency (ESA), Essential Climate Variables. (Click to zoom.) Image credits: ESA. 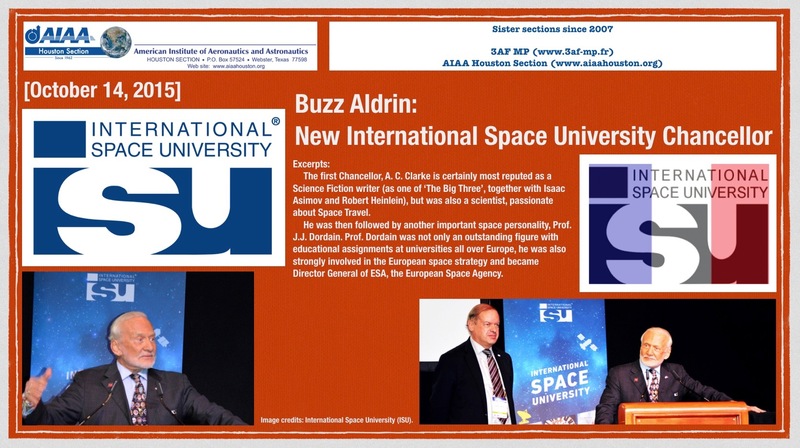 [2015 12 11] October 14, 2015: Buzz Aldin: New International Space University Chancellor. Wikipedia (Aldrin) shows that based on the tweet from Buzz Aldrin, this news is dated October 14, 2015. Above: Press release from International Space University (ISU): Buzz Aldrin: New ISU Chancellor. (Click to zoom.) Image credits: ISU. [2015 12 11] September 4, 2013: Apollo XI Under the Sea at Marseilles France. This link is for the four-page (638 KB) 2013 press release. [2015 12 10] December 4, 2015. 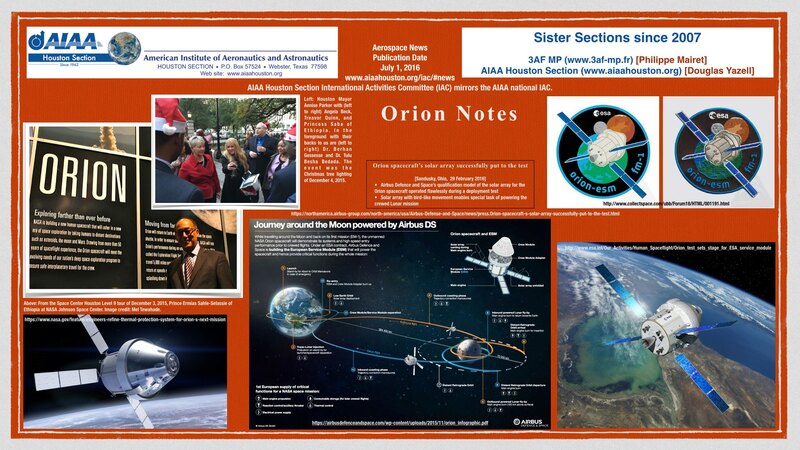 A blog entry from the NASA website blog of the NASA Administrator Charlie Bolden. 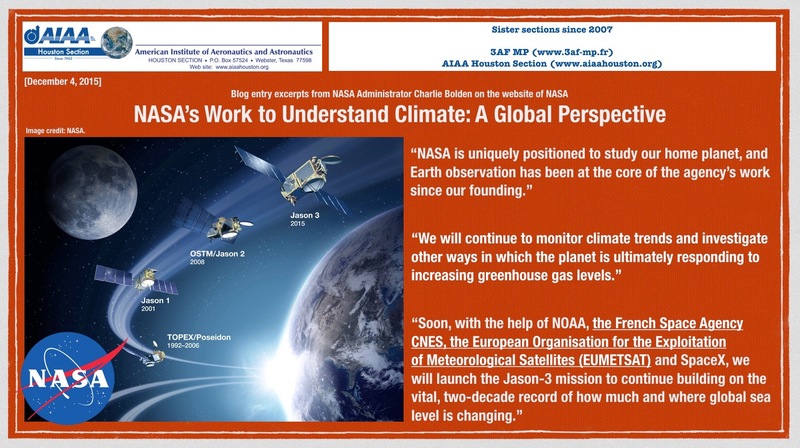 NASA’s Work to Understand Climate: A Global Perspective. 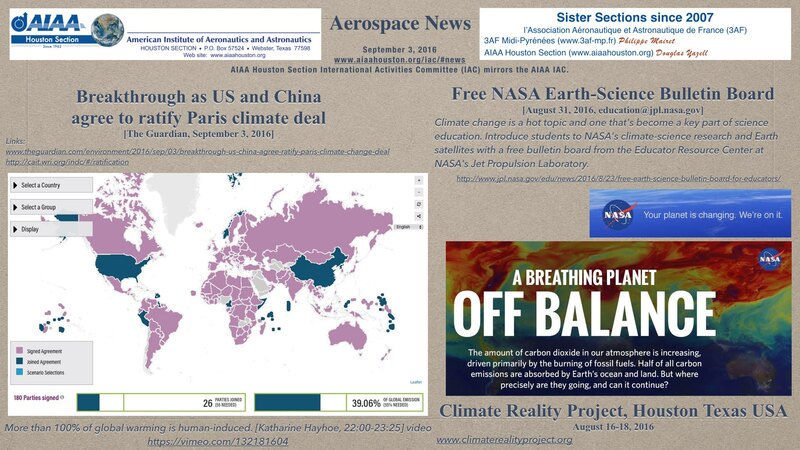 Above: [December 4, 2015] Climate change blog entry by NASA Administrator Charlie Bolden. (Click to zoom.) Image credit: NASA. Above: Historic Rocket Landing. (Click to zoom.) Image credits: Blue Origin. Video screen capture images. Above: Link for the Chinese news article is here. (Click to zoom). Image credits: DSCOVR, NOAA, Wikipedia. [2015 12 05] December 5, 2015: The Moon, Forgotten? by Philippe Mairet, 3AF MP (website: www.3af-mp.fr). Above: News article, The Moon, Forgotten? by Philippe Mairet, 3AF MP. This article is also being published in la Gazette, newsletter of 3AF MP. (Click to zoom). Image credits: NASA, IAC, ESA. 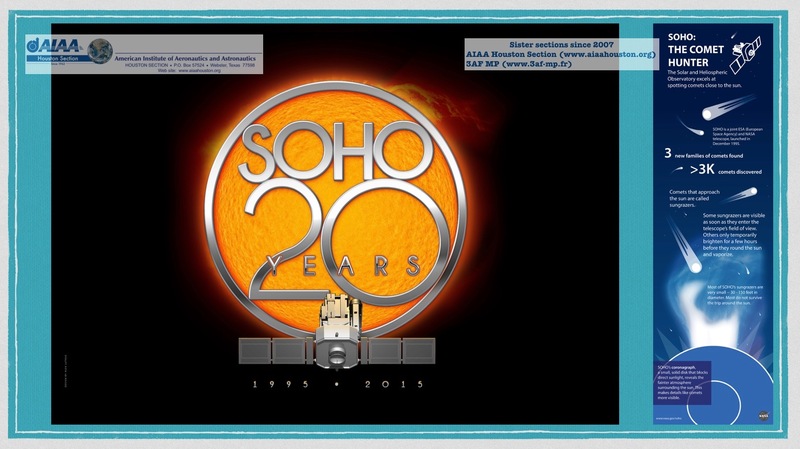 [2015 12 05] December 5, 2015: SOHO: 20 Years. Above: (Click to zoom.) Image credits: NASA SOHO Hotshots webpage and NASA SOHO Mission webpage. 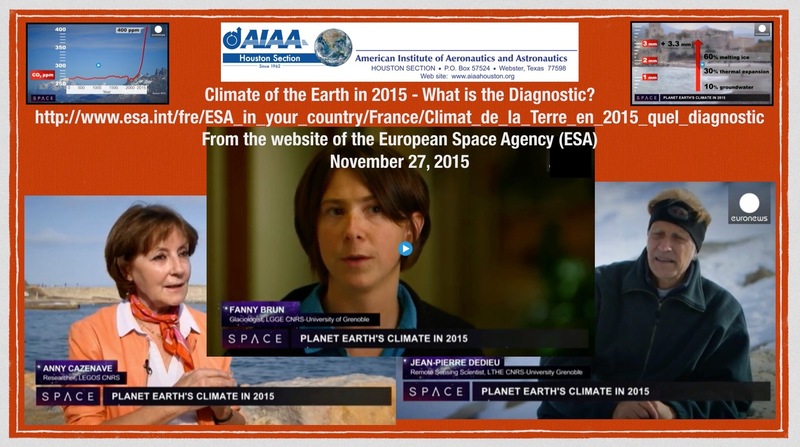 Above: [November 27, 2015] Climate of the Earth – What is the Diagnostic? This article presents a 9-minute video and the related text file from EuroNews SPACE and the website of the European Space Agency (ESA). All is in French, but can be easily translated by pasting the text into the Google Translate web page. Please note the following dates from this excerpt from the Wikipedia COP 21 article: “The 2015 United Nations Climate Change Conference, COP 21 or CMP 11 will be held in Paris, from November 30 to December 11. It will be the 21st yearly session of the Conference of the Parties to the 1992 United Nations Framework Convention on Climate Change (UNFCCC) and the 11th session of the Meeting of the Parties to the 1997 Kyoto Protocol. The conference objective is to achieve a legally binding and universal agreement on climate, from all the nations of the world.” (Click to zoom.) Image credits: EuroNews SPACE and ESA. Above: The top part of a new poster. The entire poster is available using this link. 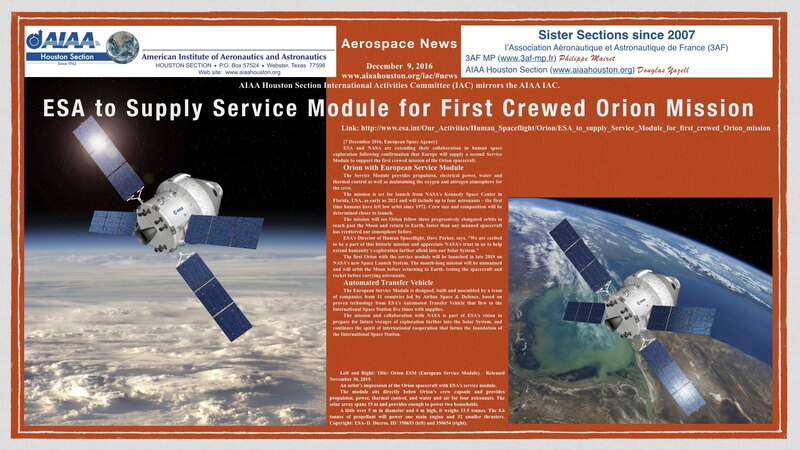 Be sure to enjoy the entire article from Airbus Space and Defense: Structural test model of Orion ESM delivered to NASA. (Click to zoom.) Image credit: European Space Agency (ESA). 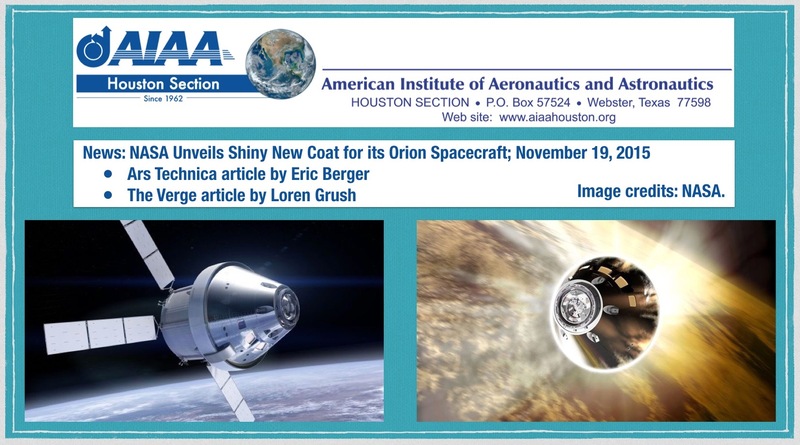 Above: NASA Unveils Shiny New Coat for its Orion Spacecraft. (Click to zoom.) Image credits: NASA. Above: Exclusive interview from Le Temps magazine (Swiss) with the new Director of the European Space Agency (ESA). For a translation from French to English, try pasting the text into the Google Translate web page. Click to zoom. Image credits: Le Temps and ESA. 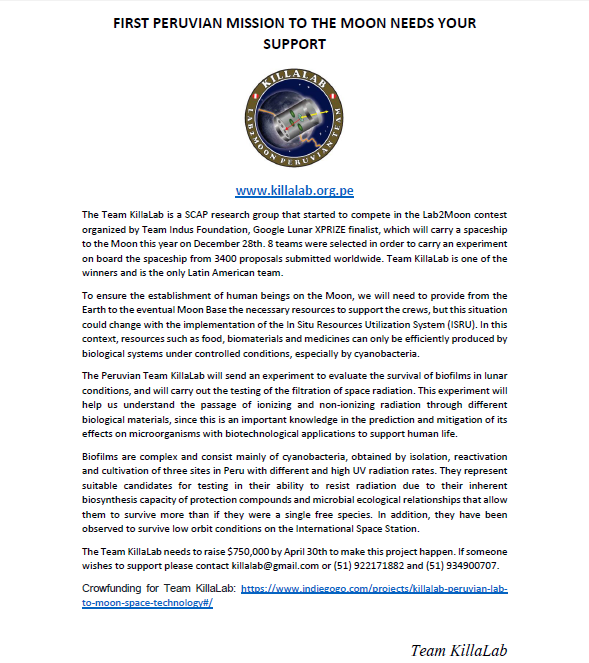 Above: ESA press release, November 10, 2015. (Click to zoom.) Image credits: ESA. Please use the above link to see that news article. This links to the English language version of that press release. Above: The NASA Orion Multi-Purpose Crew Vehicle (MPCV) with the European Service Module (ESM) from the European Space Agency (ESA). Click to zoom. Image credit: NASA artwork. Launch of satellite A-1. A for Army. 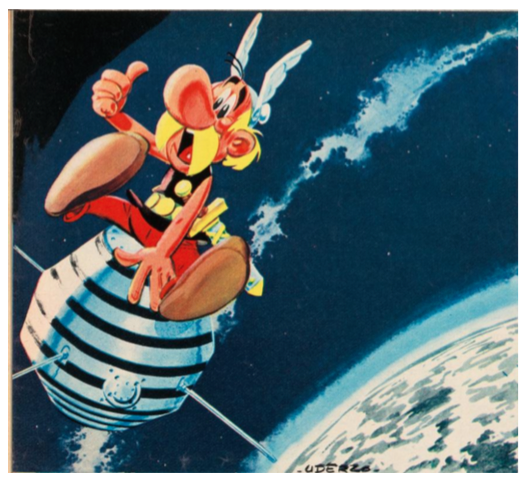 It was given another name in honor of a character in a television show for children, but at the French National Center for Space Studies, they preferred to call it Astérix, named for the famous comic book character created by A. Uderzo. Albert Uderzo will be a Guest of Honor at this 2015 event! The 10-page publicity document is available using this link (PDF format, 1 MB). 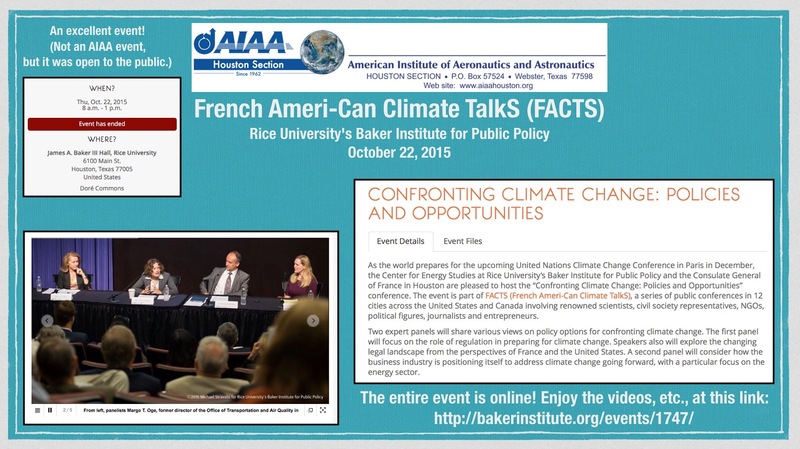 Above: French Ameri-Can Climate TalkS (FACTS) at Rice University, October 22, 2015. 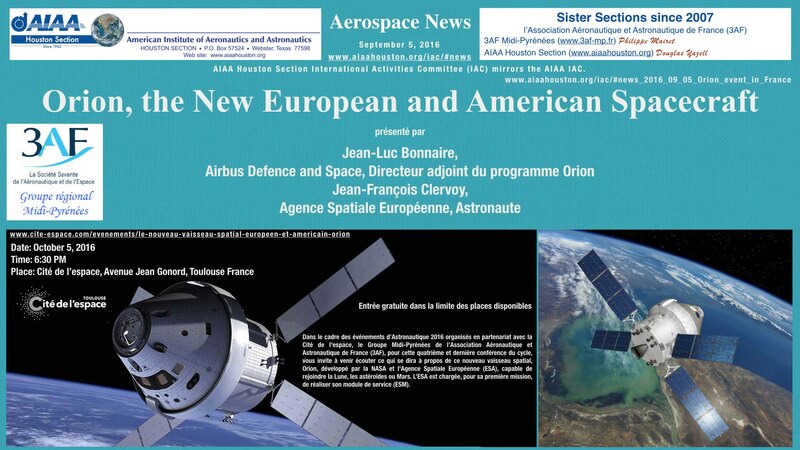 Since AIAA Houston Section enjoys a French sister section relationship with 3AF MP (www.3af-mp.fr), this is an event of great interest to our Section. Enjoy the videos and related files at this link at Rice University. (Click to zoom.) Image credit: Rice University. Above: Composite image by Douglas Yazell using NASA images. 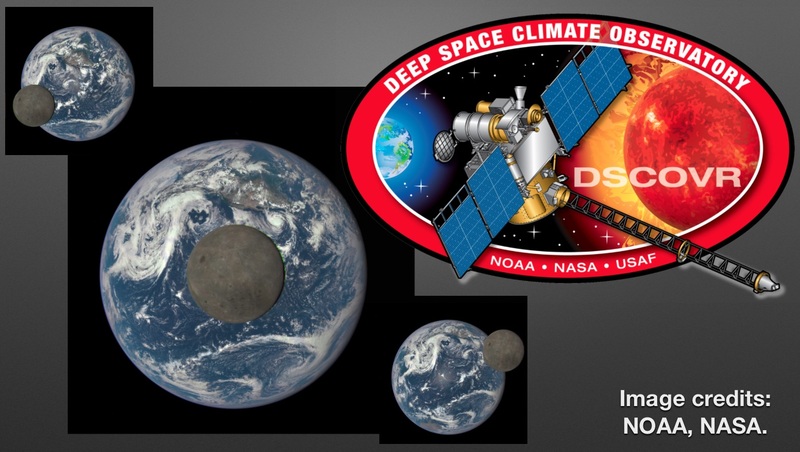 Thanks to the Wikipedia DSCOVR article for the NASA DSCOVR logo. Click to zoom. Christian Mari, SAFRAN Group, is now the AIAA Director-At-Large, International, after the 2015 AIAA Board of Directors election. 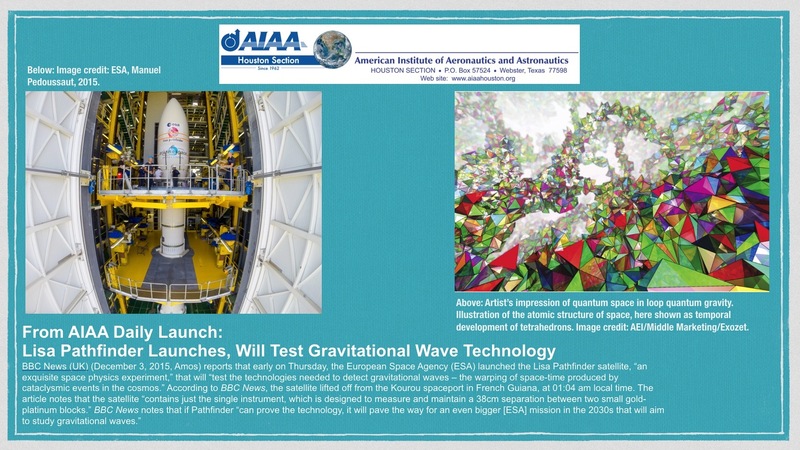 These results are announced in an AIAA press release dated April 15, 2015. Here we provide a link to the Safran Wikipedia article. 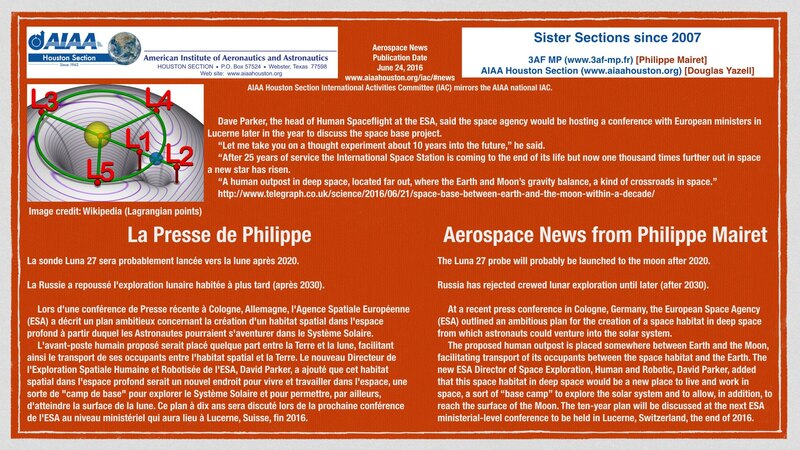 Of course, one reason for the creation of this news article is Christian Mari’s service to 3AF, since 3AF MP (www.3af-mp.fr) is the French sister section of AIAA Houston Section. For example, a 2012 3AF internet article refers to Christian Mari, Emérite 3AF. Congratulations to European Space Agency Director General Jean-Jacques Dordain on his successful ESA service in that role since 2003. His successor takes office on July 1, 2015, only about two months from now. 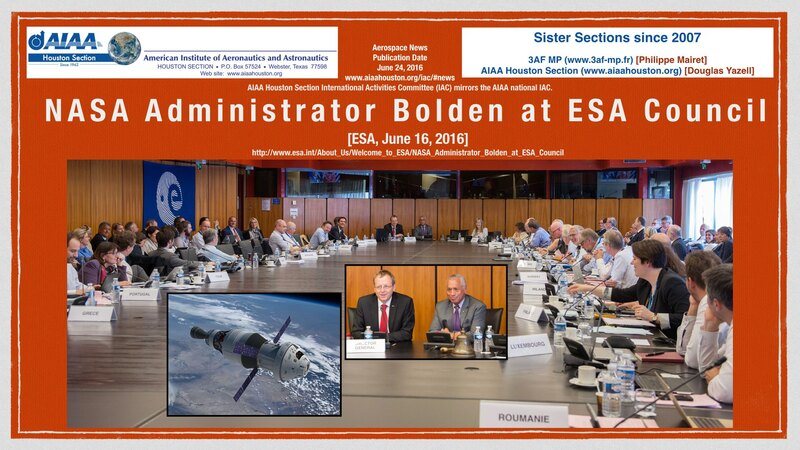 Of course, if Mr. Dordain comes to Houston, AIAA Houston Section will do its best to ensure a pleasant visit, and we would enjoy hearing from him in a dinner meeting presentation, a Lunch & Learn forum, etc. He we provide a link to the Dordain Wikipedia article. Novespace To Resume Microgravity Flights With “Zero-G” Airbus A310. Here we provide link to the company website for Novespace. Former longtime Houston resident Jean-François Clervoy is president of Novespace, as explained in the Clervoy Wikipedia article. Read the press release using the 100YSS press page link and the press release date (March 5, 2015). This conference, co-organized by the IAA, IISL, and the KSCSTE (Kerala State Council for Science, Technology and Environment), focuses mainly on the many contributions of space in the understanding of climate change. Specifically, of 50 variables used to define the climate, 26 can only be measured from space, demonstrating the importance of this area to assess the changing climate. The IAA is a non-governmental organization recognized by the United Nations, which brings together 1,200 international experts in astronautics from about 75 countries. Its objectives are to promote the development of astronautics for peaceful purposes and to honor those who are distinguished in astronautics. It promotes international cooperation for the advancement of aerospace sciences. Then he emphasized, “the important role of the international program GCOS (Global Climate Observing System)”, recalling that, “Europe, and specifically France, were actors in the forefront in climate observation.” In this area, the programs named Copernicus, Jason, SWOT and Merlin are of major importance. Cooperation between India and France is already very productive, notably with missions Megha-Tropiques and Saral-AltiKa. Translation from French to English by Douglas Yazell, with excellent help from http://translate.google.com. [2015 02 19] February 19, 2015 Climate Change Science & Public Policy. A link to the dinner meeting presentation charts (PDF and PowerPoint PPTX) are provided here. Our speaker was Dr. Barry Lefer of the University of Houston. He teaches climate science, though his specialty is air pollution. The title of the position statement of the American Geophysical Union is Human-Induced Climate Change Requires Urgent Action.